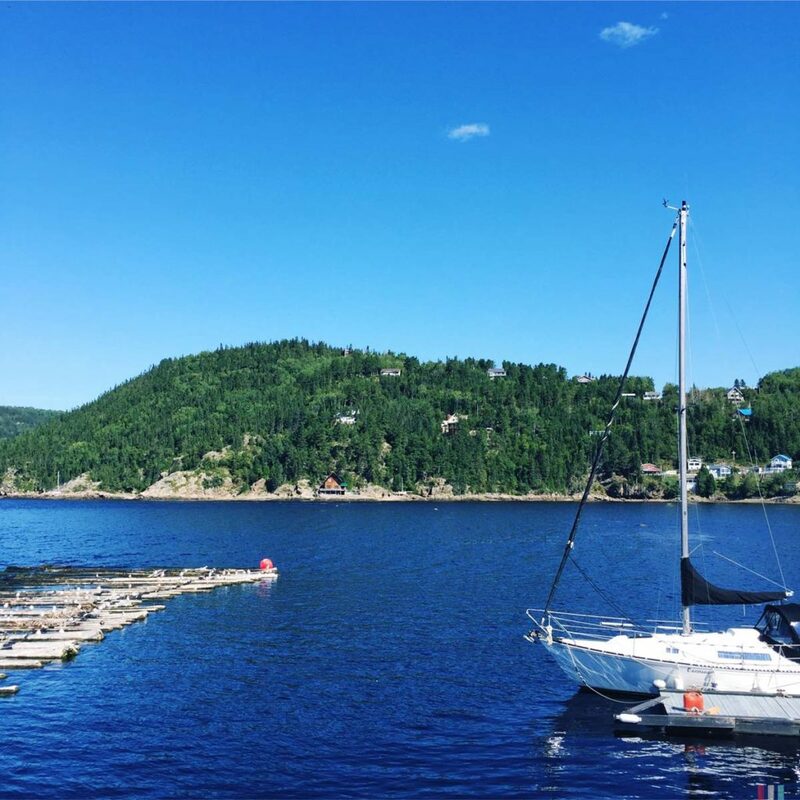 The perfect combination of road trip and whale watching: three weeks on the whale route in Quebec. 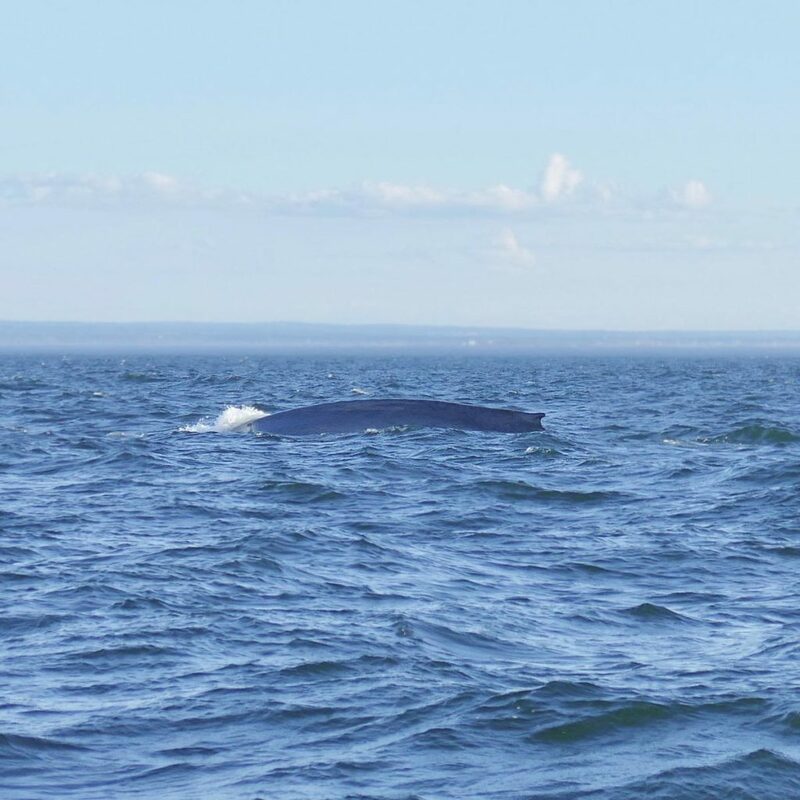 A three weeks whale watching road trip in Quebec. Belugas at Baie de Sainte Marguerite. There’s no other place in the world where you can meet them so far south. 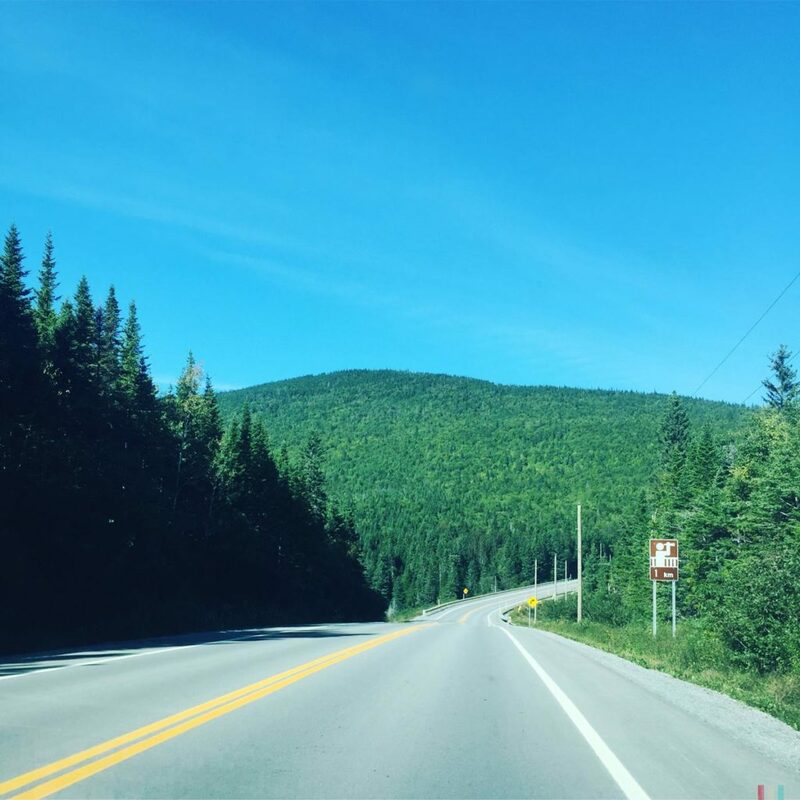 A little bit of France, a little bit of Canada, that's about the basic feeling when going on a road trip in Quebec. Plus: the whales! 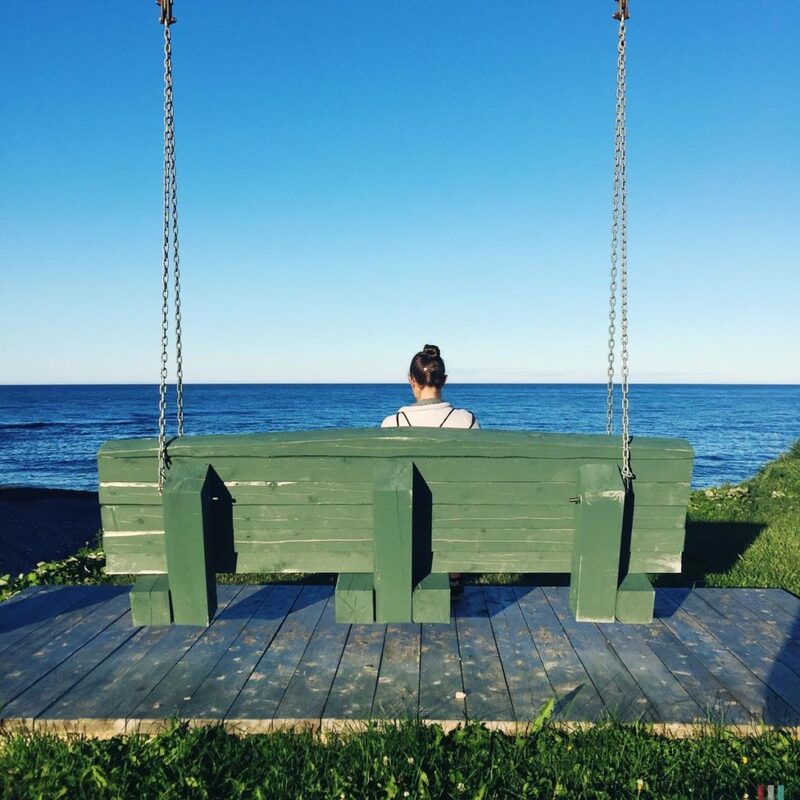 The situation was clarified right on the very first evening: We sat for dinner in a small restaurant in Quebec City and the friendly young waiter had continuously used some older French words, which sounded quite unusual to our ears. So, for dessert, we asked him: that here in Quebec people seem to really speak a different French than the real French in France. Right? It’s always great to get things visualized, it makes complex issues so much clearer. Especially on the first evening, before you set off on a long road trip. Quebec: large circle; France: small circle. So much for the basic rules here. 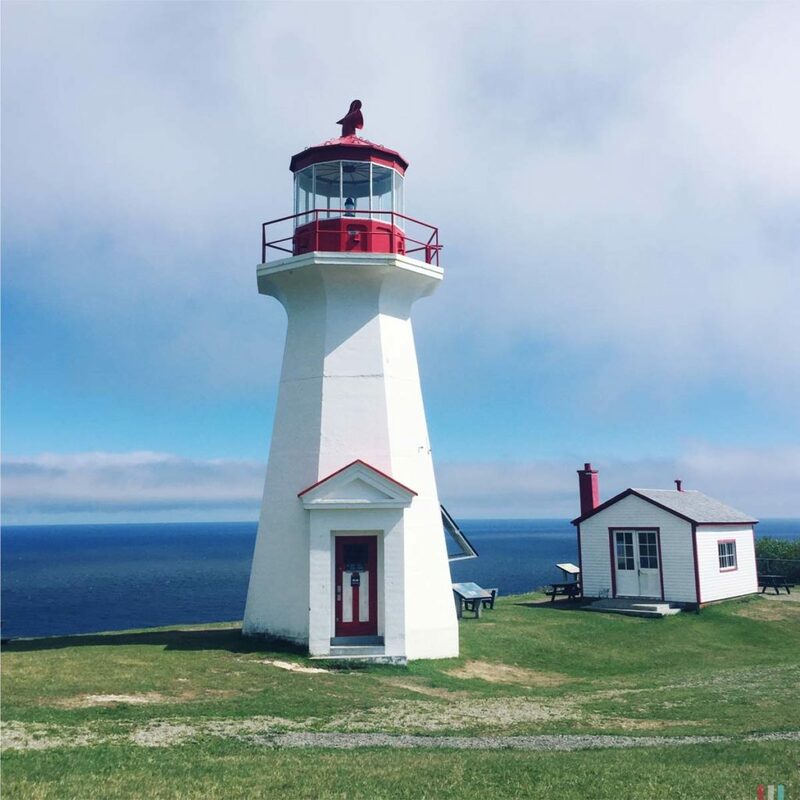 The little lighthouse at Cap Gaspe. 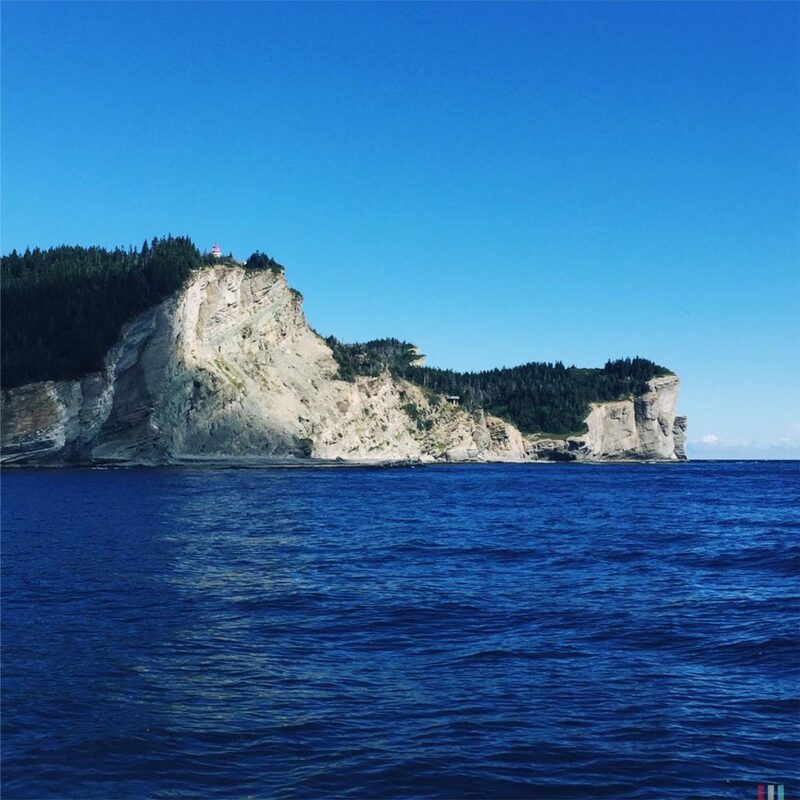 Perce Rock on Gaspe Peninsula. The little harbor on Cap Gaspe. 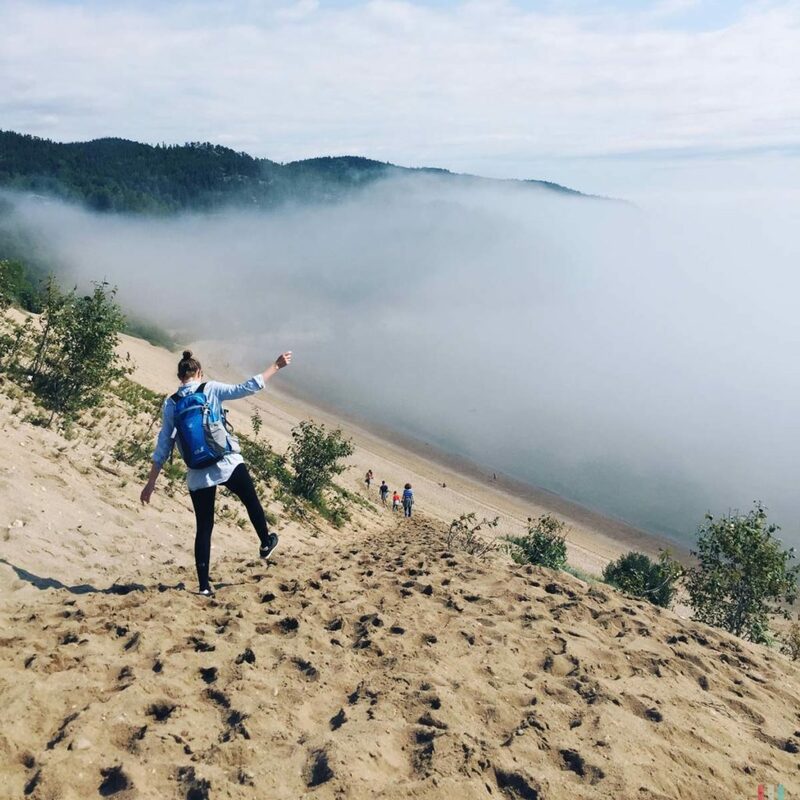 Theresa at the big dune in Tadoussac. 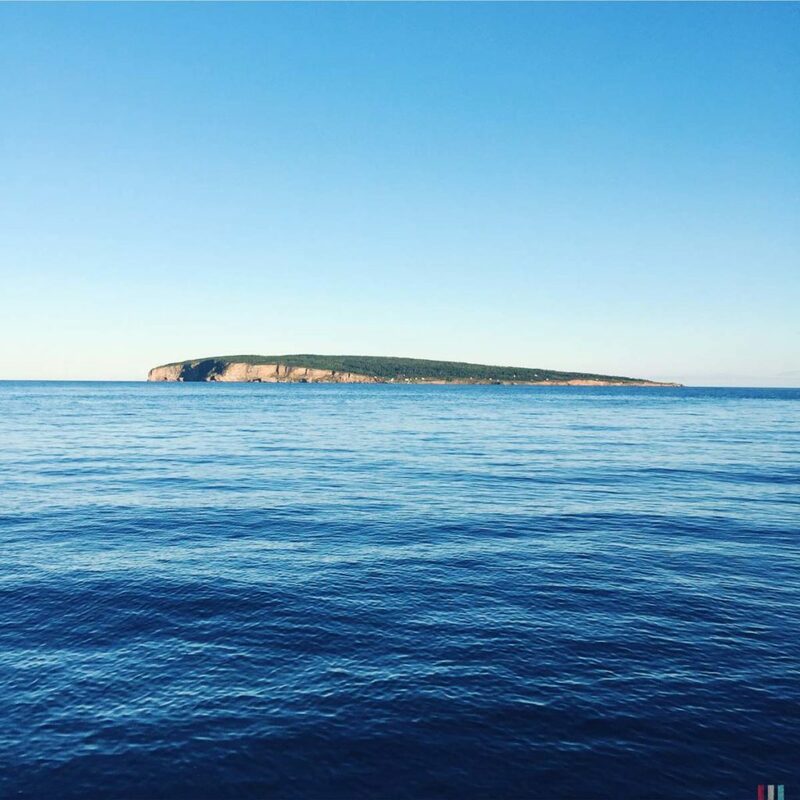 Cap Gaspe, seen from the water. One of the thousands of lighthouses. Later in the hotel, we looked that up: Quebec is a good three times bigger than France – but there are about eight times as many people living in France. No doubt, the friendly young waiter would have had a clear explanation why Quebec still was the French centre of the world. We’ve been to Canada several times, once in the Rockies, once on the Sunshine Coast, a few times to Vancouver Island. And however, I never really noticed that Canada is a fully bilingual country. On all signs, no matter where they are, everything is always written in English and French. And I seem to have always overlooked that. 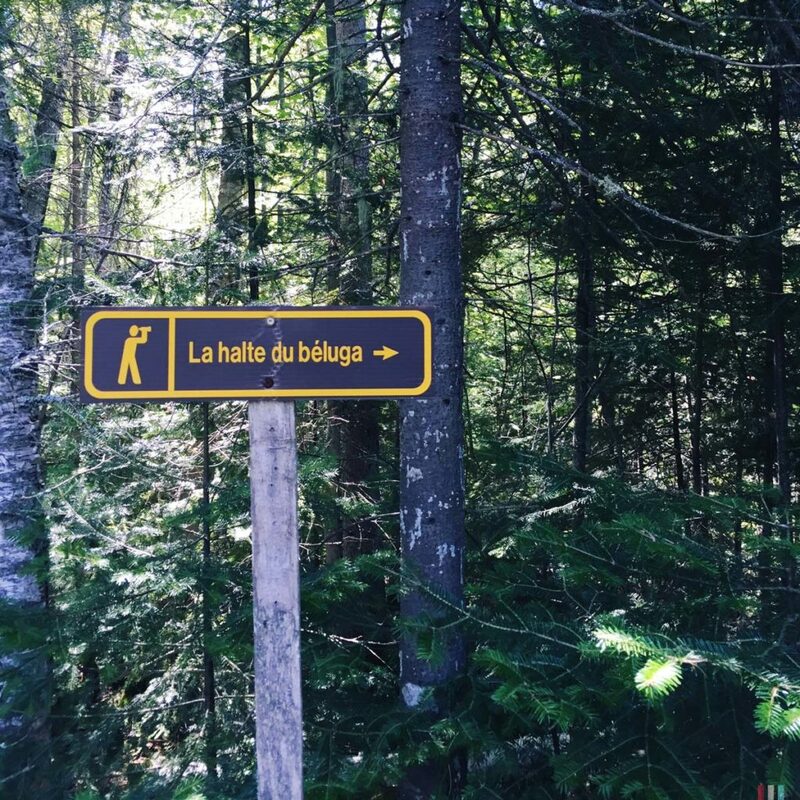 So, the basic feeling in Quebec is French. In the beginning, I thought you could easily get by with English, that’s still Canada after all. But that doesn’t work at all, you’ll learn this from the very first small talk, just like in France. And not by chance they have the blue and white flag hanging everywhere, unmistakably saying: this is Quebec, not Canada. In a referendum on the spin-off from Canada back in 1995, 49.42 percent of the people voted with ‘yes’ while 50.58 percent voted ‘no’. Quebec: large circle; Canada: only minimally larger circle. Quebec is the land of moose and bears. But not so much the land of the Boulangeries. Of course, Quebec’s basic feeling is also quite Canadian. 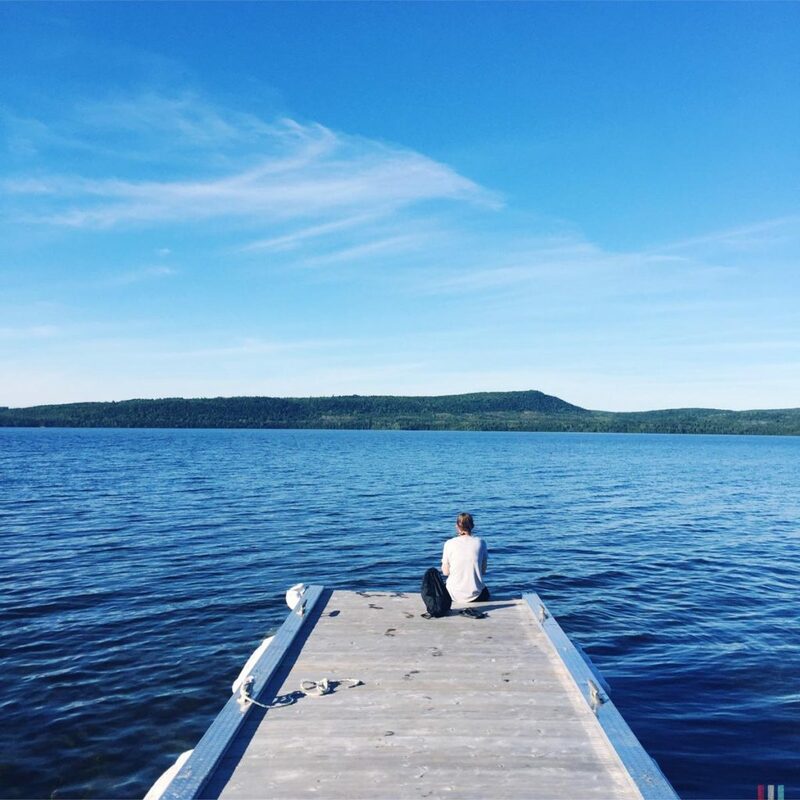 Just take the vast expanses: You can drive around for days without encountering a single human being, Quebec is the land of moose and bears. 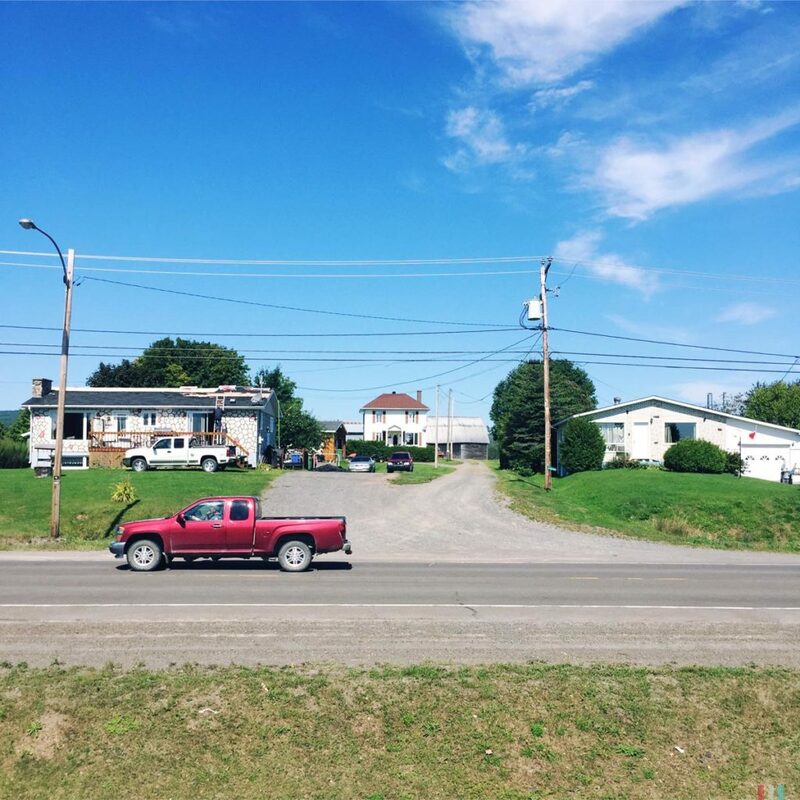 Like everywhere else in Canada, you drive around with a pickup truck, for which there is an infinite amount of parking space – just like everywhere else in Canada. Also, the many Boulangeries are a steady reminder that you’re in Canada and not in France: the bakeries are called the same as in France, but they’re not nearly as good. Sorry for that! 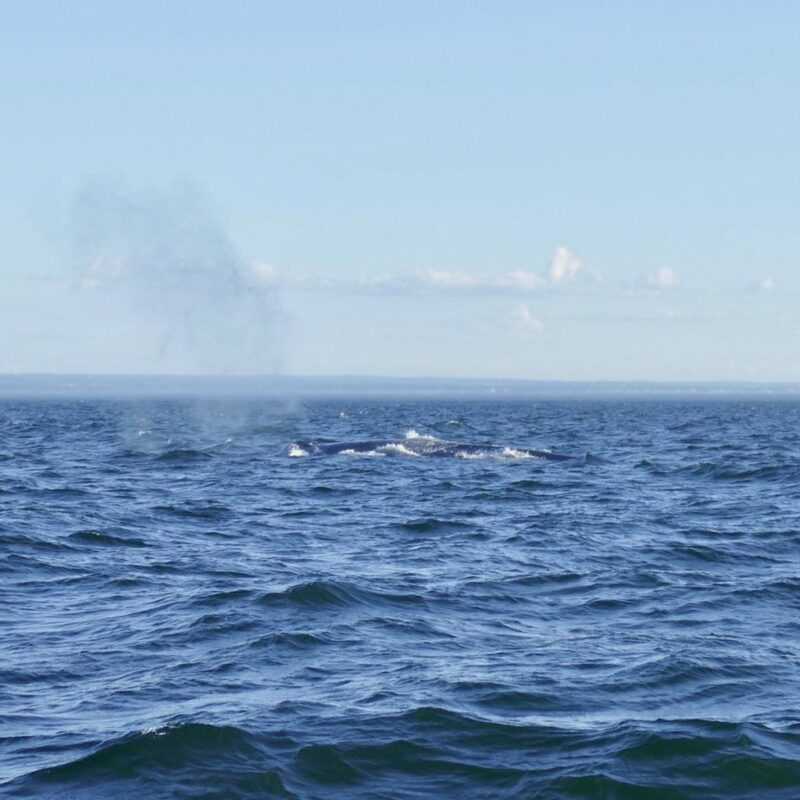 Where Quebec is 100 percent Canada and no France at all: whale watching! There’s even a road trip called ‘the whale route’. And road trips with whales are exactly our thing. So, let’s go! 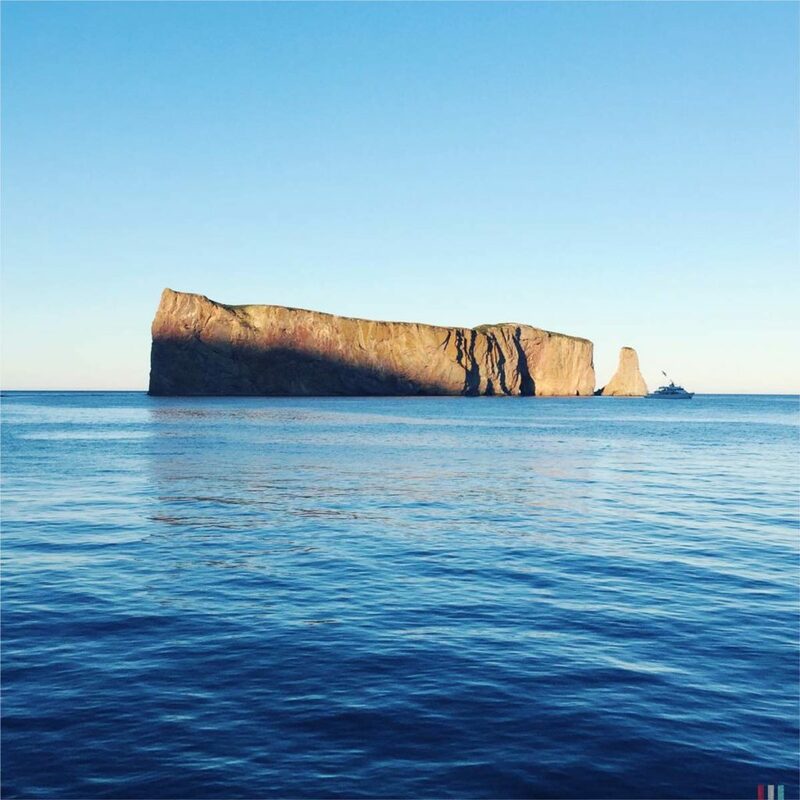 Perce Rock at Gaspe Pensinsula. In the evening it looks very nice, especially with a cold beach beer in hands. On the whale route you can observe many kinds of whales. The diversity along the Saint Lawrence is probably unique in the world. 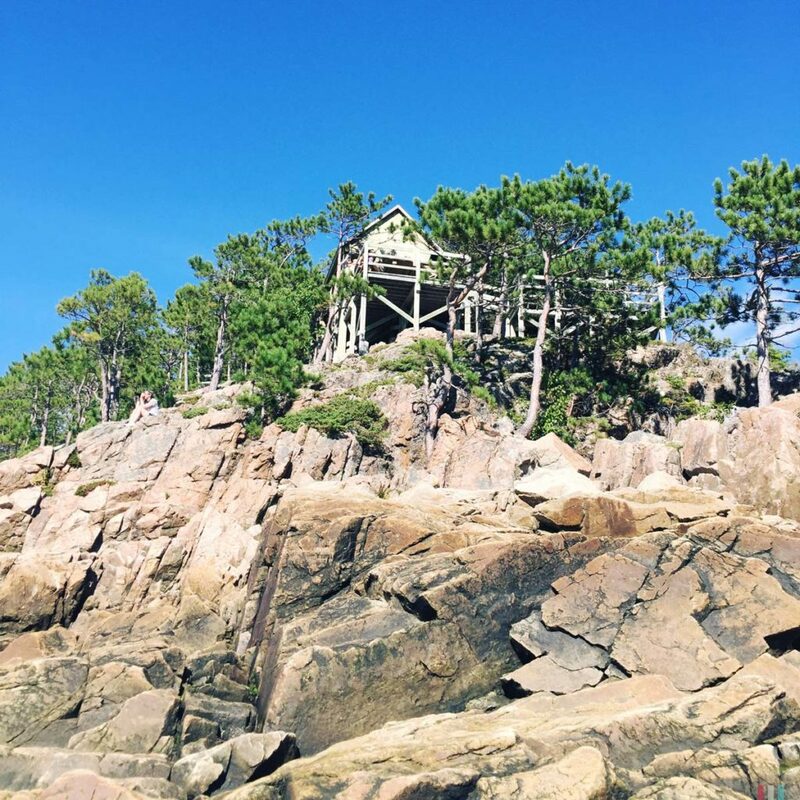 The whale route runs between Tadoussac and Blanc-Sablon for a good 1,700 kilometres, passing endless beaches, rugged cliffs and beautiful white lighthouses. Everything here feels like a dreamy fishing village in Normandy. 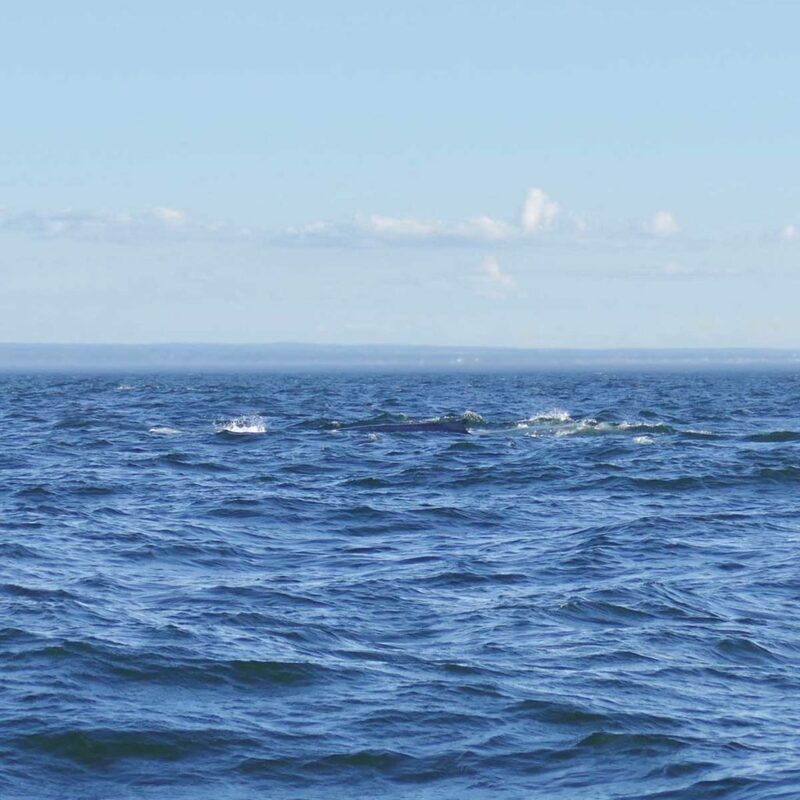 The main difference is that the Saint Lawrence River is one of the world’s richest waters for whales. 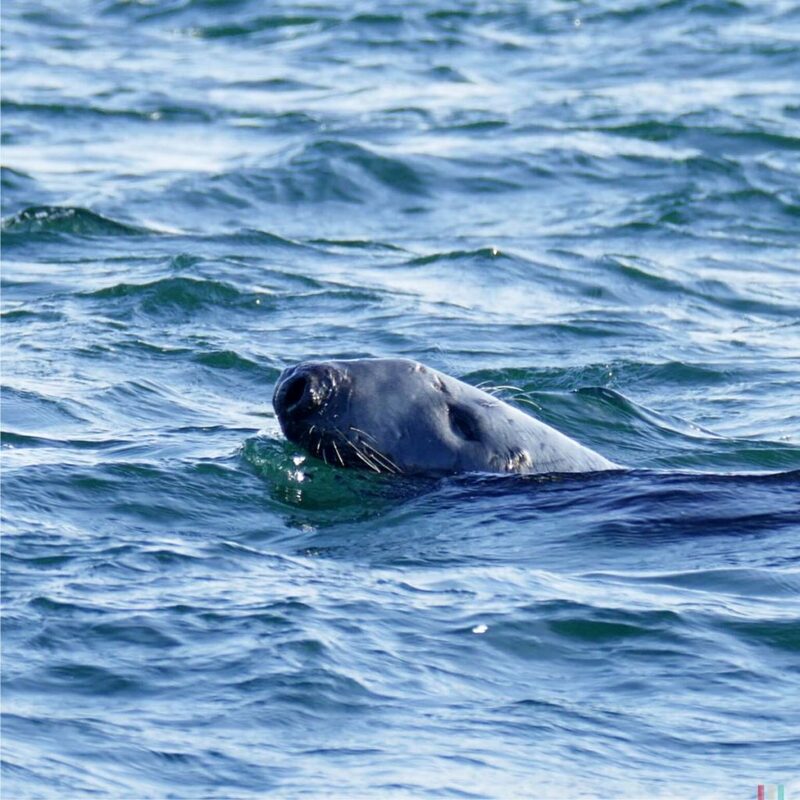 You can see minke whales, fin whales and humpback whales as well as blue whales and belugas, with good luck even northern right whales, of which there are only a few hundred left in the world. In addition, even a single and confused narwhal from the Arctic has been regularly seen here for some time. This diversity is probably unique in the world. 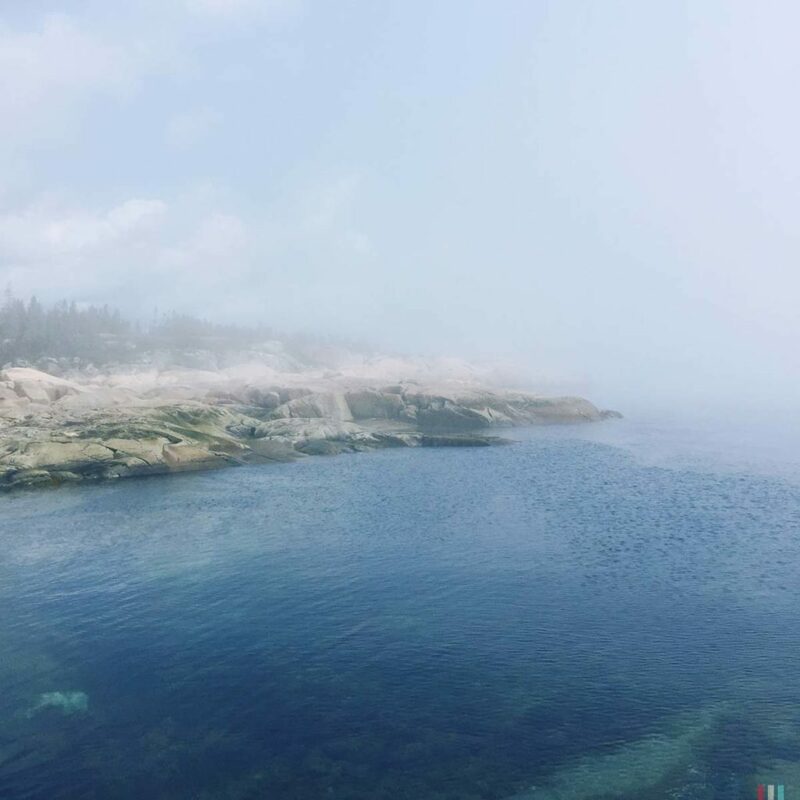 We took the whale route from Tadoussac (very pretty!) via Sept-Iles to Mingan, which is about half the distance. On the way you can stop at any halfway bigger village and watch whales either by boat or from land. With Tadoussac and Bergeronnes being the hot spots. I’ll come back to that later. Road signs along the whale route. Road through Forillon national park. Somewhere on the whale route. Wait for the winters here! 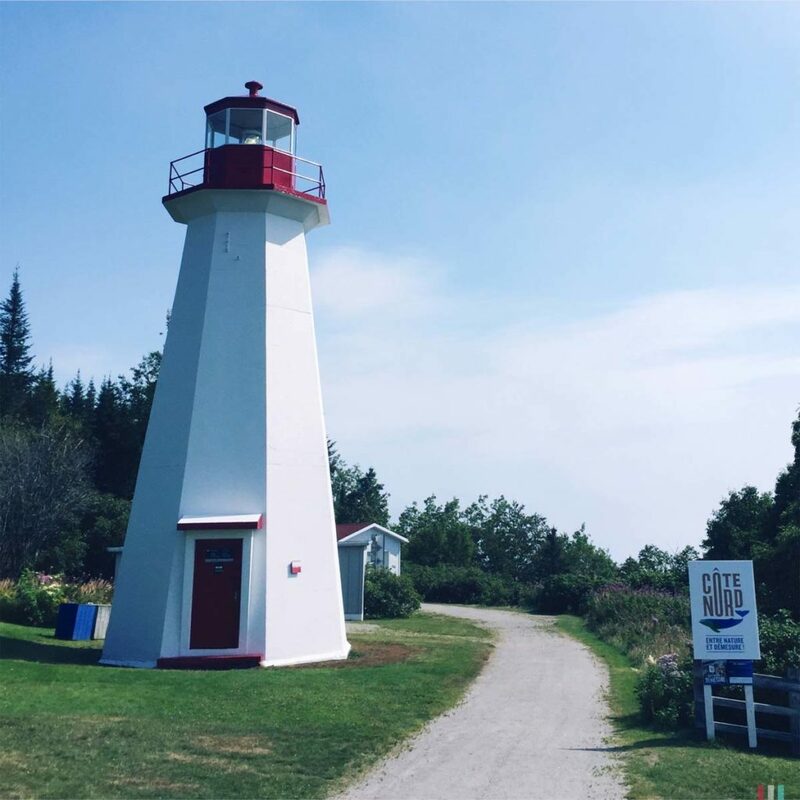 The lighthouse at Cap de Bon Desir. 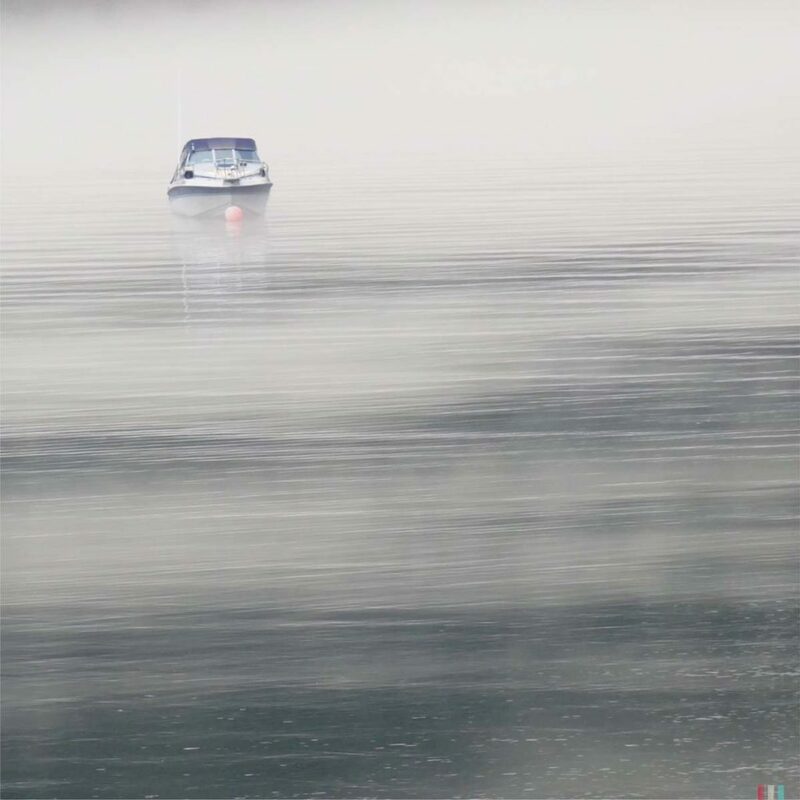 More fog at the harbor! Thousands of miles of coastal roads. 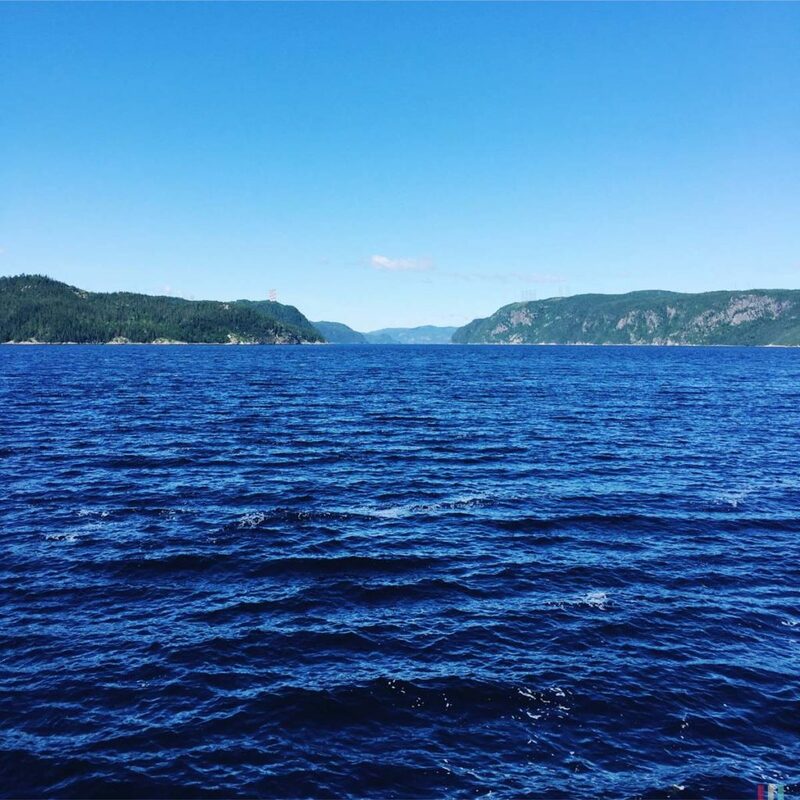 The entrance to Saguenay fjord. Swing with the perfect view. 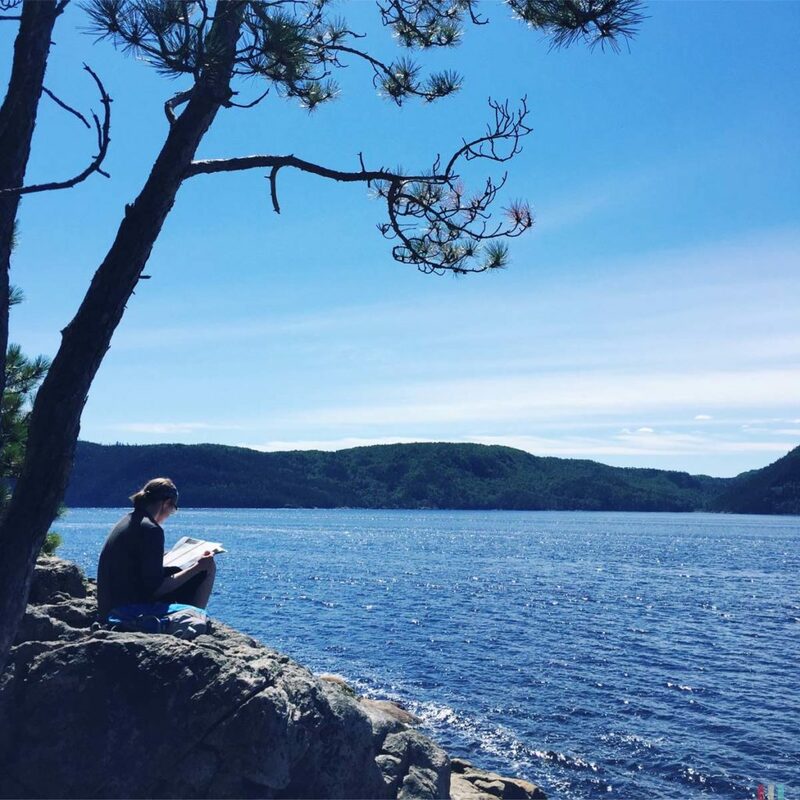 L'Anse de Roche at Saguenay. The further north you go, the more isolated you are. In Mingan we visited the whale museum and the researchers of Mingan Island Cetacean Studies. 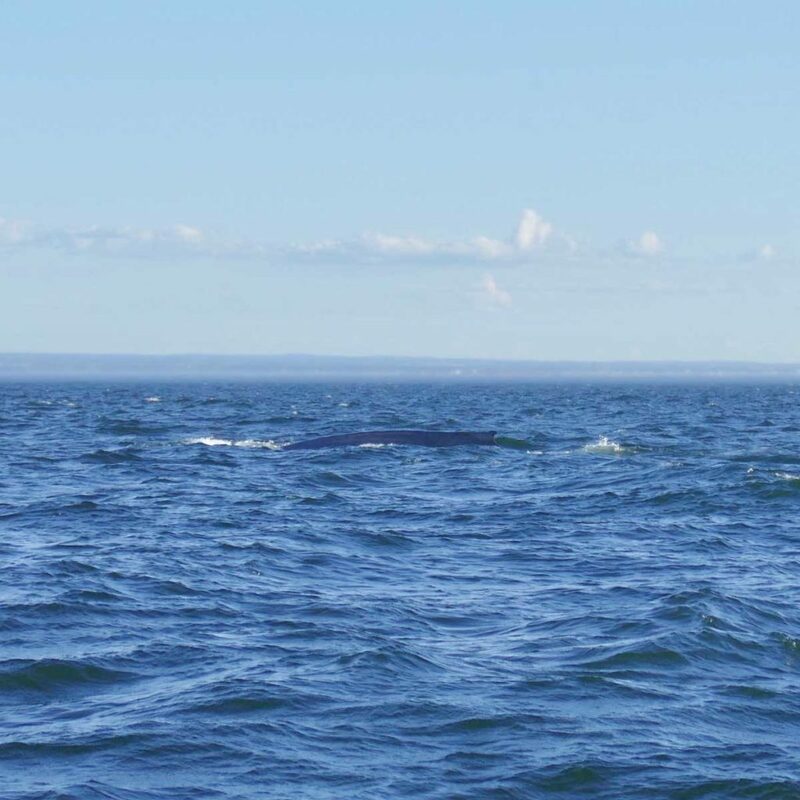 In the waters off Anticosti, MICS carries out long-term observations, especially of blue whales, and for some time the northern right whales of Massachusetts and Maine are also of great interest. The interesting thing is that the researchers let tourists join them on their tours as a pretty smart way to finance their work. And there’s so much to learn. With MICS, a tour can take up to ten hours, all the time in a tiny inflatable – marking whales together, identifying flukes and fins and documenting behaviors. A day in the life of a researcher! 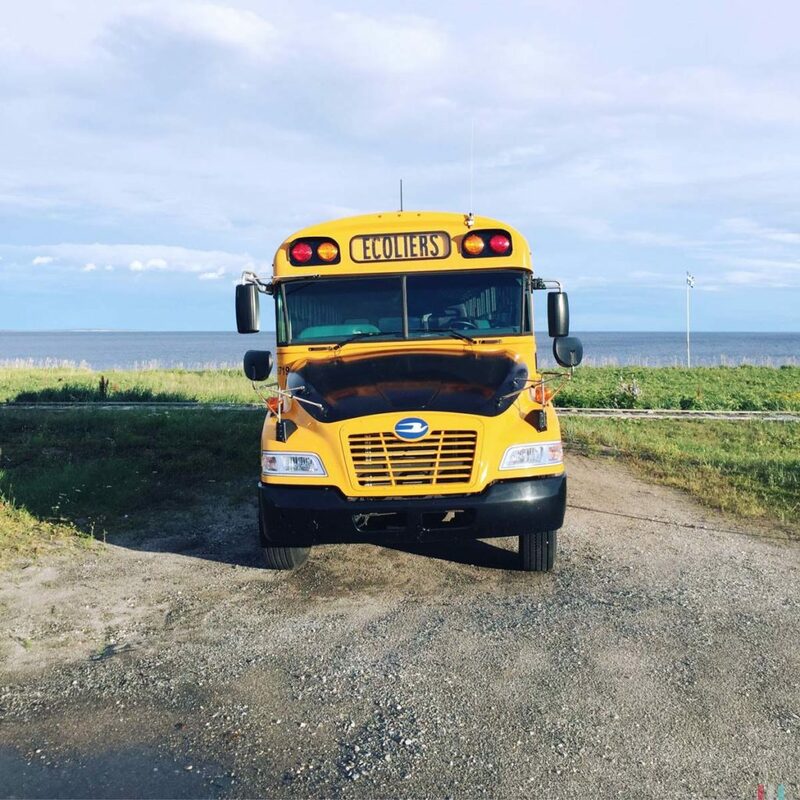 Next stop: Gaspe Peninsula! On the crossing we saw porpoises nearly every minute. Porpoises are the smallest of all whales, only about two meters long. And they are quick! You won’t see them any longer than a millisecond. To make things even more complicated, they are totally unpredictable. You never know where they might surface next. I tried to make some photos, but no chance, at least for me. I got maybe one or two useful pictures – from a hundred tries. There’s so much more to learn. Marking whales, identifying flukes and documenting behaviors. A day in the life of a researcher! 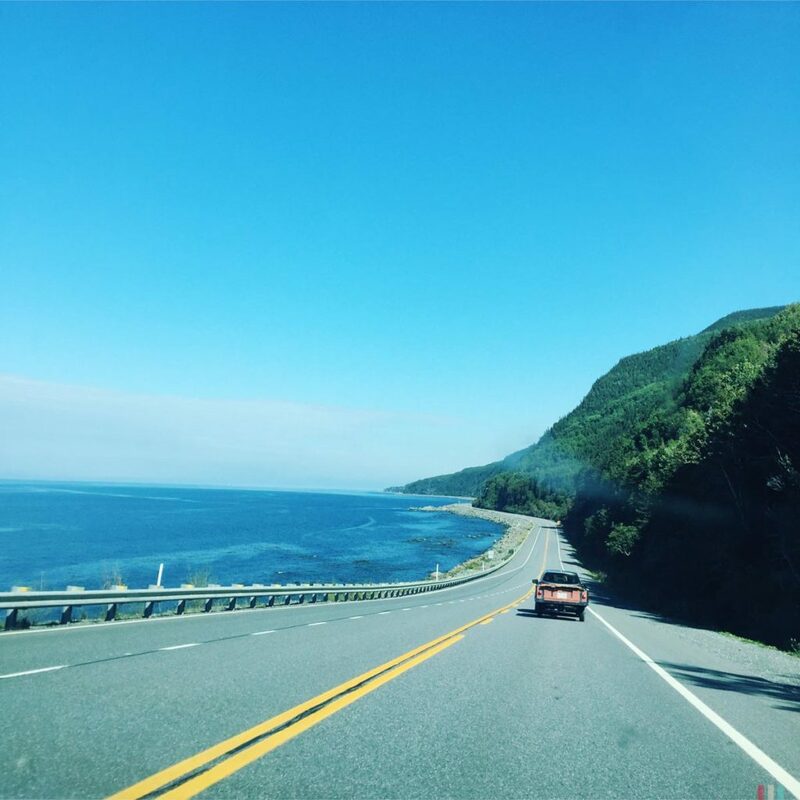 It takes a good week to drive around Gaspe Peninsula. The cliffs are a bit steeper and the forests are even wilder than on the whale route. 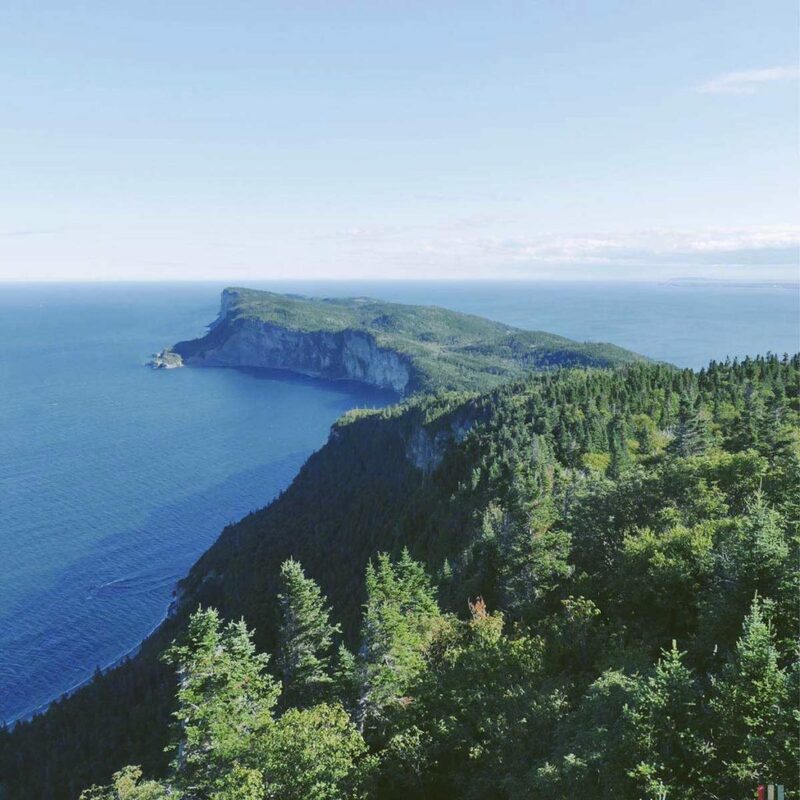 Most national parks on the east coast can’t keep up with the spectacular parks in the Rockies or on Vancouver Island – but the wild and beautiful Forillon National Park on Cap Gaspe can! Close to Forillon is the small coastal town of Perce with its huge and well known Perce Rock just outside the door. 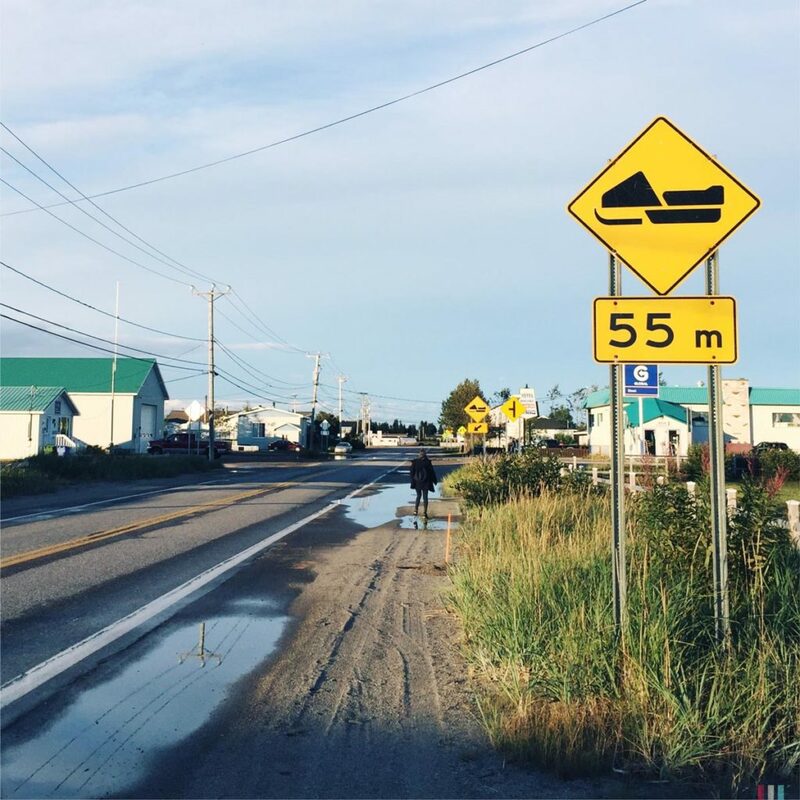 We definitely wanted to meet this guy – a bright orange stone block that moves a few centimeters away from the mainland every year. In the evening it looks very nice, especially with a cold beach beer in hands. We stayed for a few nights. Whale watching boats at the Saint Lawrence between Tadoussac and Bergeronnes. 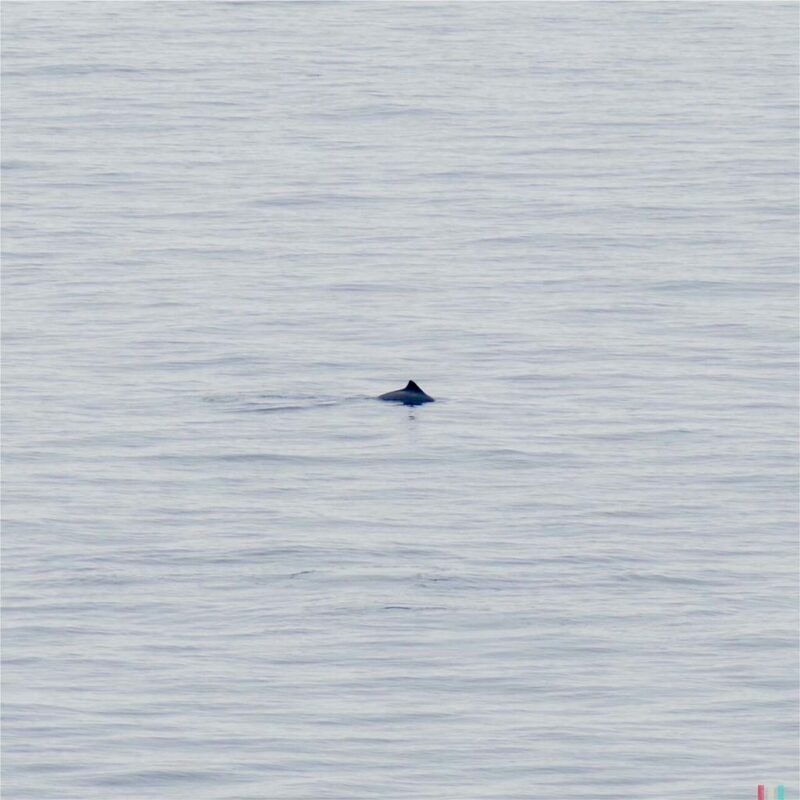 Somewhere in between: a minke whale. After a few days we sat sad and disappointed in the kitchen and discussed whether we should skip whale watching for a while. 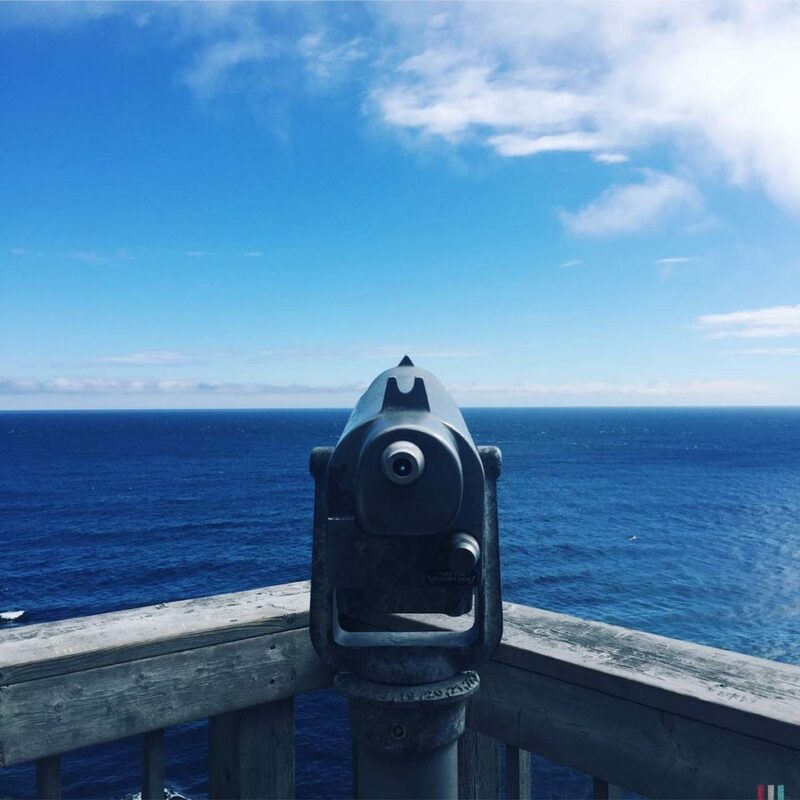 It came a bit out of the blue, but after a few days we sat over breakfast and discussed wether to shorten our stay in Quebec and drive straight on to the west coast – or wether at least we should skip whale watching for the next few weeks. 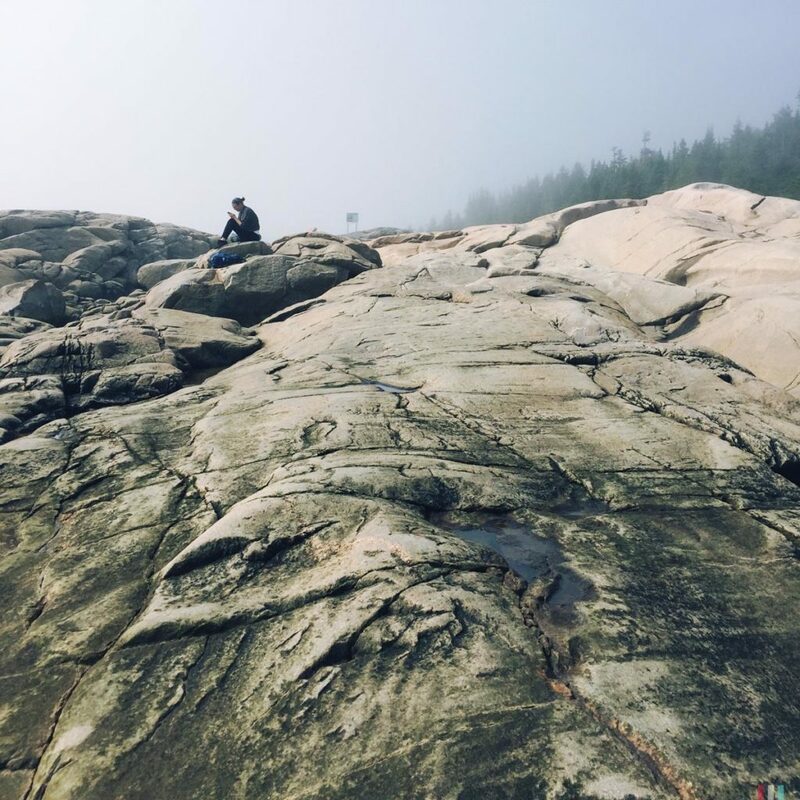 Maybe more hiking and less whale watching would be the best option here. So, what had happened? After our first tour we were confused. But maybe we just had bad luck and a bad operator. After the second tour with another operator we were a bit worried. And after the third tour with another operator we had our discussion in the kitchen. Three times can’t be bad luck. 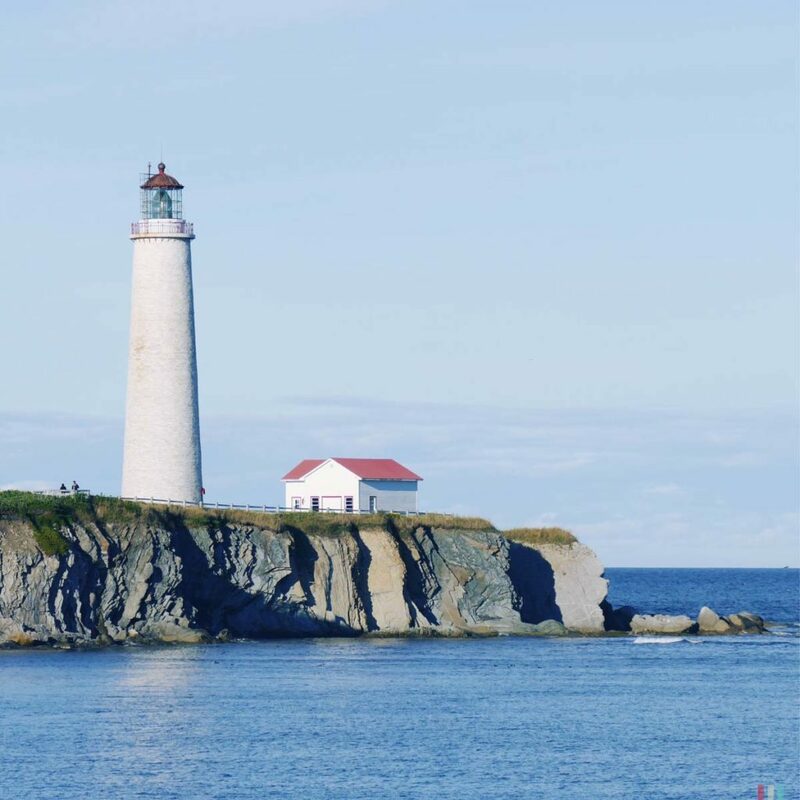 The east coast surely is the whale watching hot spot in Canada, especially the southern parts of Saint Lawrence. There’s a lot of whale watchers here – and a lot of operators with lots and lots of boats. This combination led to the fact that sometimes up to eight (!) boats accompanied, surrounded and traced one single poor whale. The boats outnumbered the whales by far. They often got way too close and they often stayed far too long. A humpback. His name is Gaspard. A harbor porpoise. Smallest of all whales. A fin whale. Second largest of all whales. ... the only good tour we had, though. A beluga at Saint Lawrence. 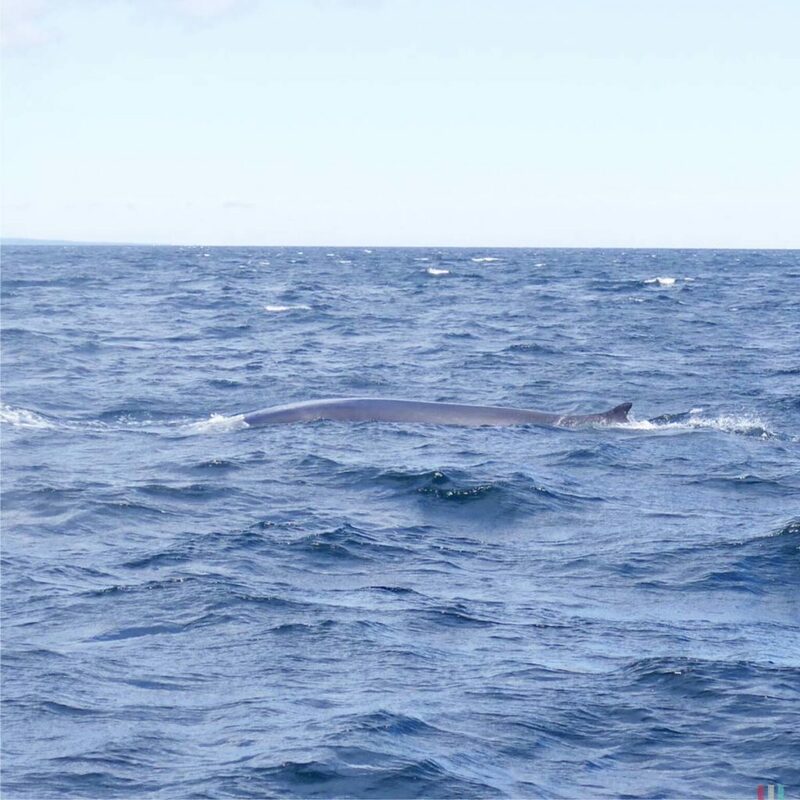 A fin whale off Cap Gaspe. A beluga at the entrance to Saint Lawrence. A grey seal. Looks like ALF. Belugas all day. Evening at Saint Lawrence. On a good whale watching tour you have a guide on board, who explains, classifies and, in the best case, is totally thrilled himself, even at the hundredth whale sighting. A good guide can steer the peoples enthusiasm and blessing after a tour into the right direction – for example by giving some hints on the problems faced by whales, the sea and the environment and by sharing some ideas what you can do about it in your everyday life back at home. The Saint Lawrence River is a rather polluted and trafficked area. Noise, nets, collisions – the whales here have it all but easy. A good guide could lose a few words about that, for example. Sometimes it all begins with building some awareness. 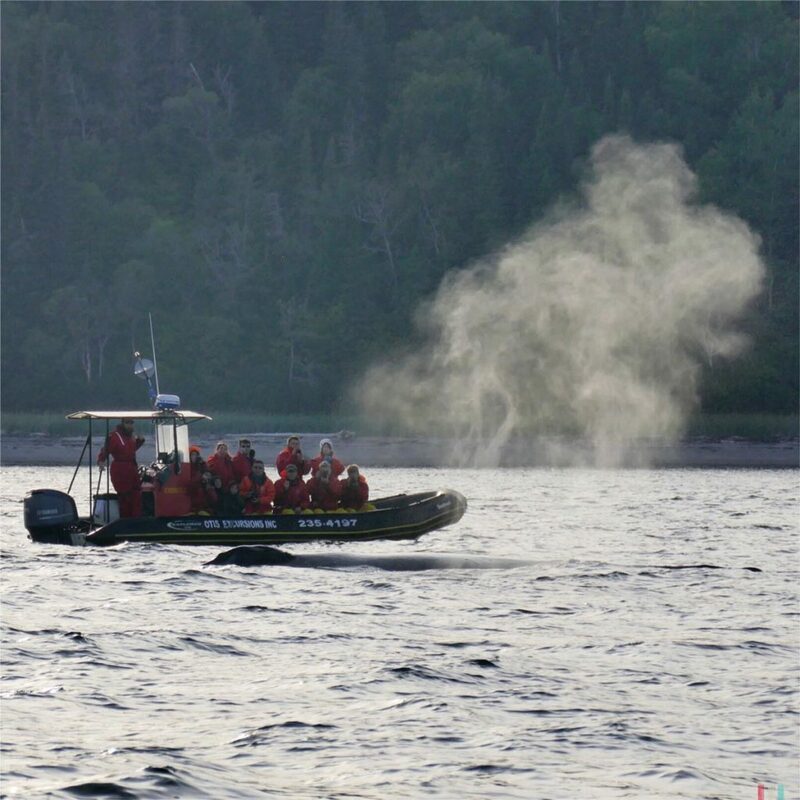 On our three tours from Tadoussac and Bergeronnes we didn't see anything that makes a good whale watching tour. 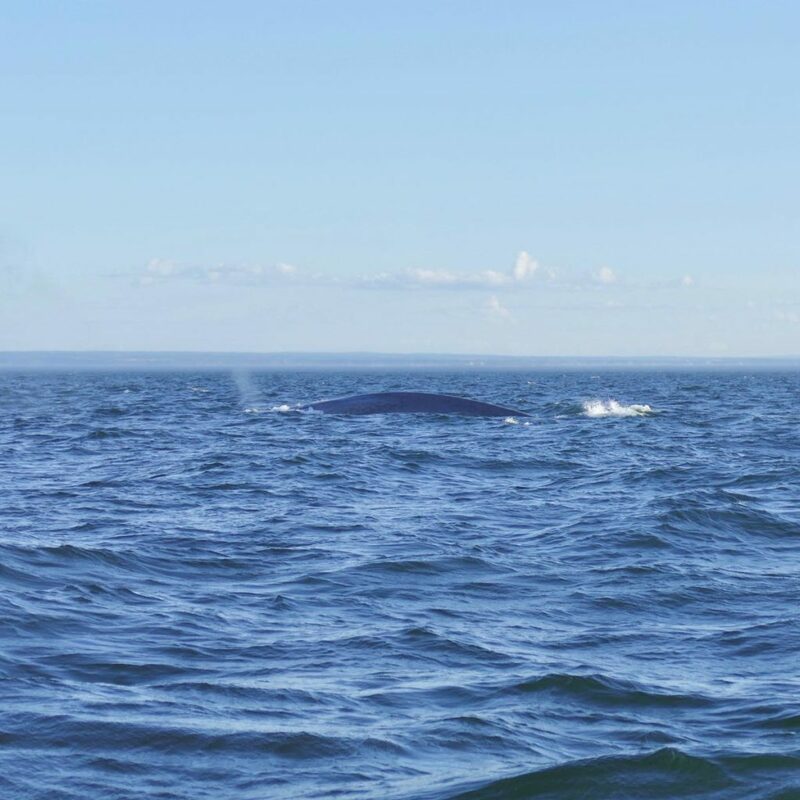 On our tours, however, we were simply put into a boat and hurried to some whale. The whale then was tracked and traced until everyone on board had a proper shot for Instagram or Facebook. From time to time our guides told some basics about the species the people just had photographed. Work to rule. No enthusiasm, nowhere. Then we went on to the next whale. Like a zoo, only without bars. On three tours we didn’t experience anything that makes a good whale watching tour. And we really didn’t have the faith to try out a fourth operator. 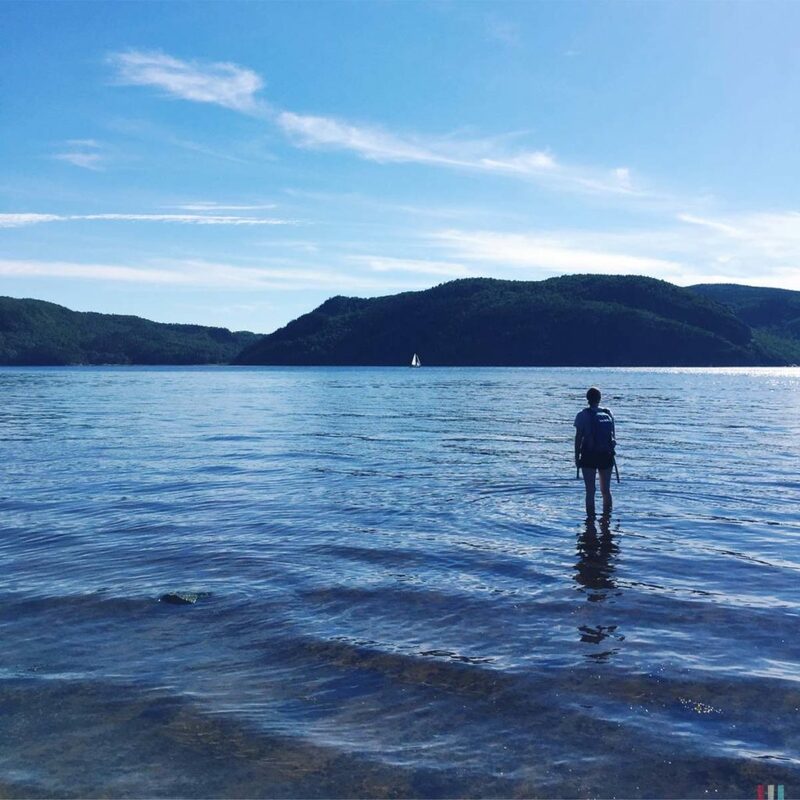 So, we decided not to book any further tours around Tadoussac and Bergeronnes. Moreover, especially in Quebec, there is no need for boats at all. 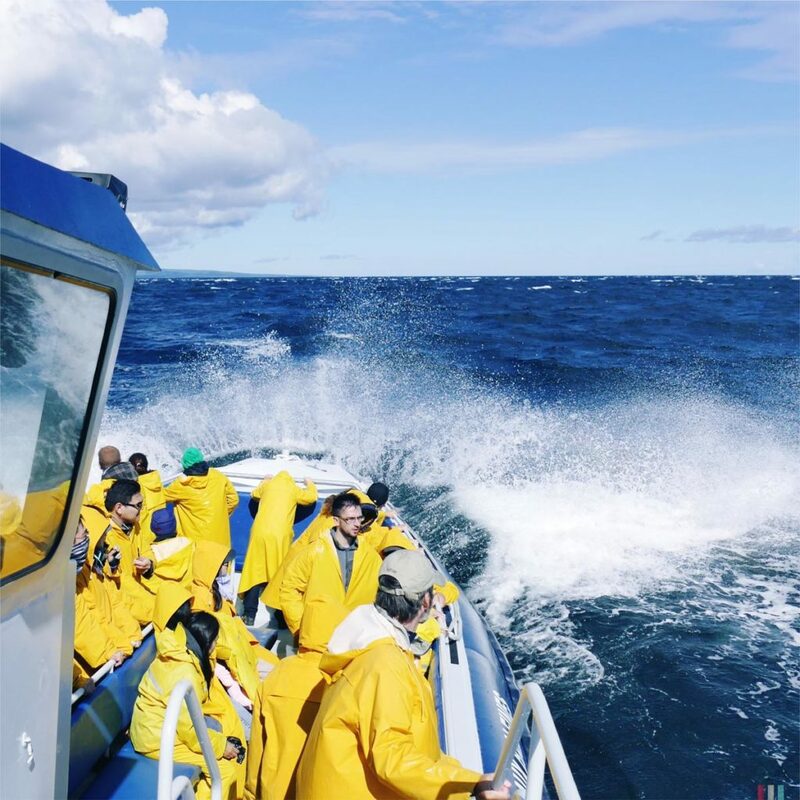 Along the whale route, there’s not only a large number of operators and whale watchers – but also many, many places where whales can be observed very well from land. And that’s even fun! 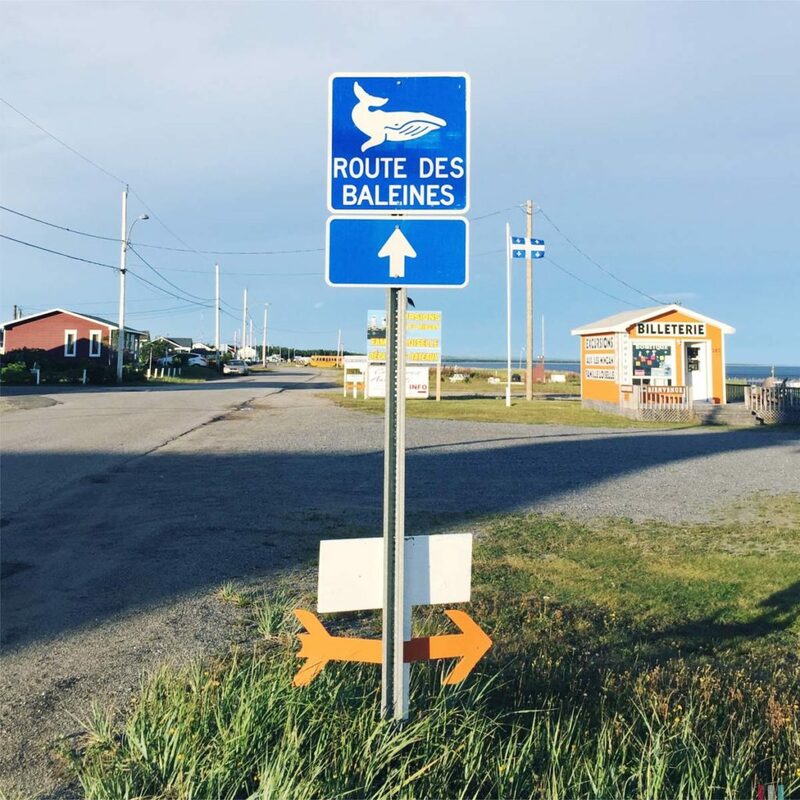 The little whale interpretive center at Cap de Bon Desir. 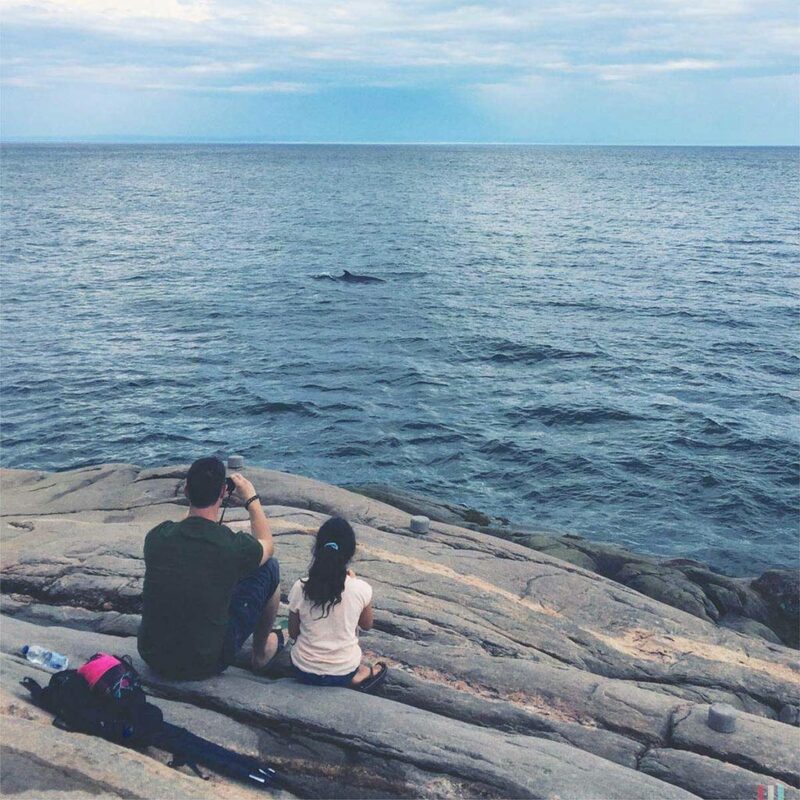 The rocks at the shore are a great place for land based whale watching. You just sit on the shore for hours and wait and watch and hope. Boring as hell. And amazingly exciting, especially for children. 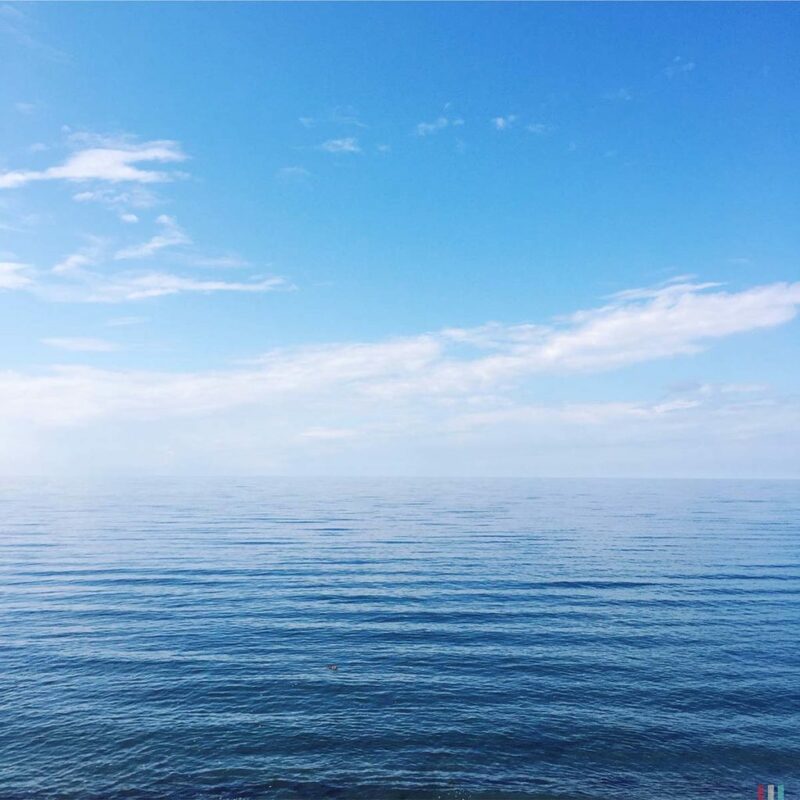 Whale watching from land is a fantastic idea. You just sit on the beach or some rocks and wait. 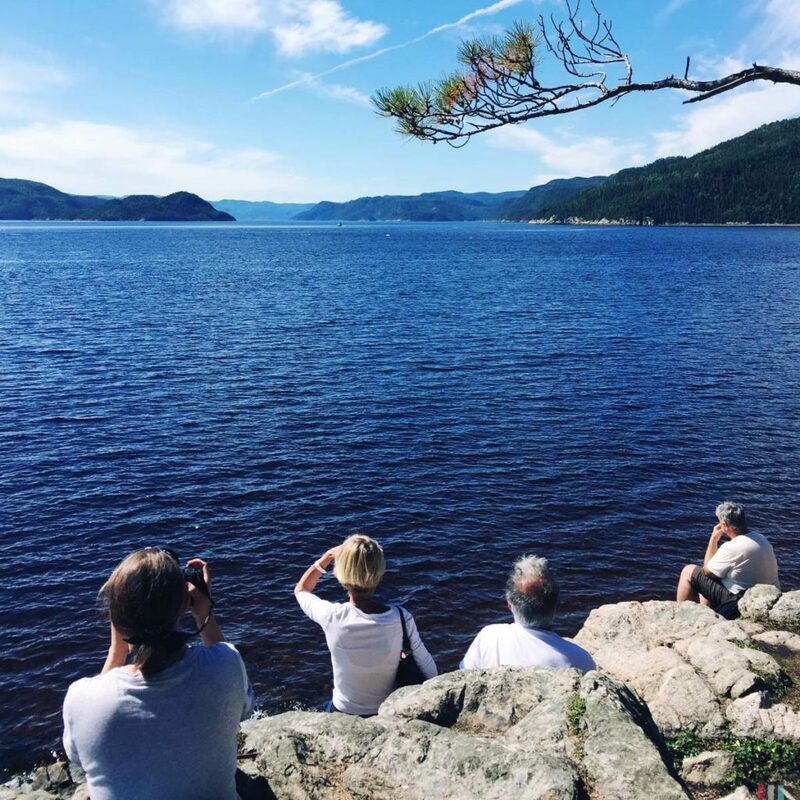 Along the whale route there are many places with great land based whale watching opportunities: for example at Pointe de l’Islet in Tadoussac, at Cap de Bon Desir north of Bergeronnes and at Baie de Sainte Marguerite in the Saguenay fjord. But you can be lucky at quite any beach with a reasonable good sight. 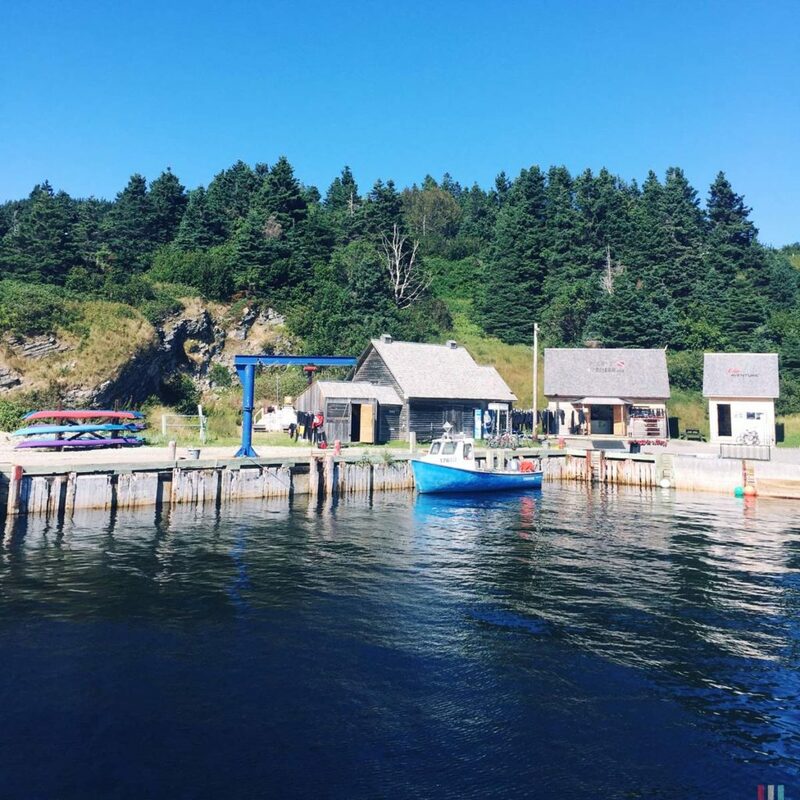 At Cap de Bon Desir there is even a small whale interpretive centre with information boards and free guides who brought all the things that the guides on board of our three boat tours unfortunately didn’t have: time, knowledge and enthusiasm. Perhaps this is one of the best things about whale watching: time. Time and this special uncertainty. You just sit there in the sun for hours and wait and watch and hope. This is on the one hand boring as hell – and on the other hand amazingly exciting. If you’re unlucky, you spend half the day sitting there for nothing. You just have to be lucky. 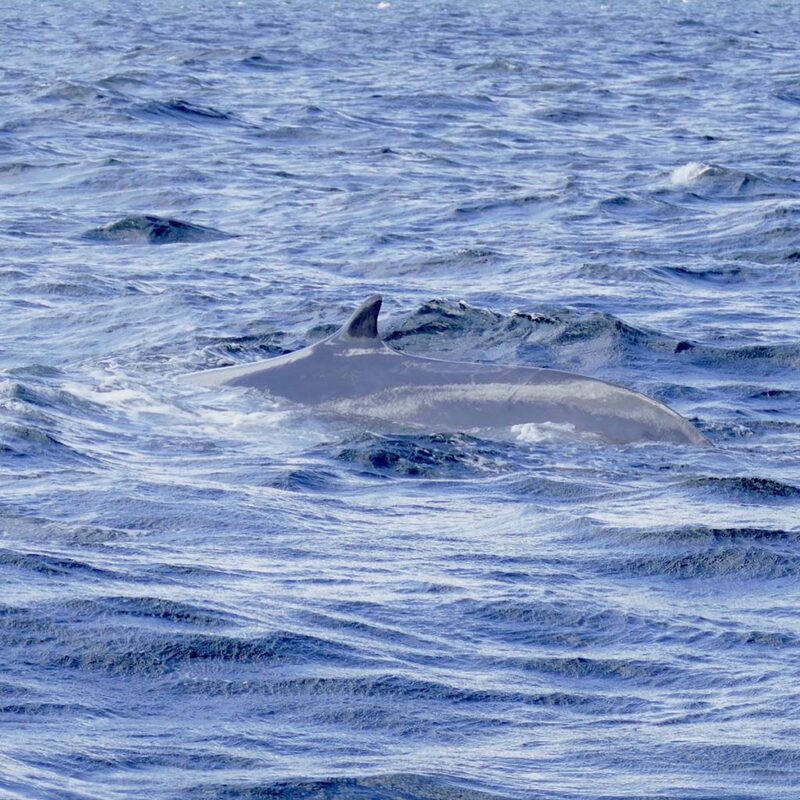 A minke whale at Cap de Bon Desir. It kept swimming along for a while. Pointe de l'Islet in Tadoussac. Theresa at Cap de Bon Desir. Theresa at the whale museum in Mingan. Land's end at Cap Gaspe. 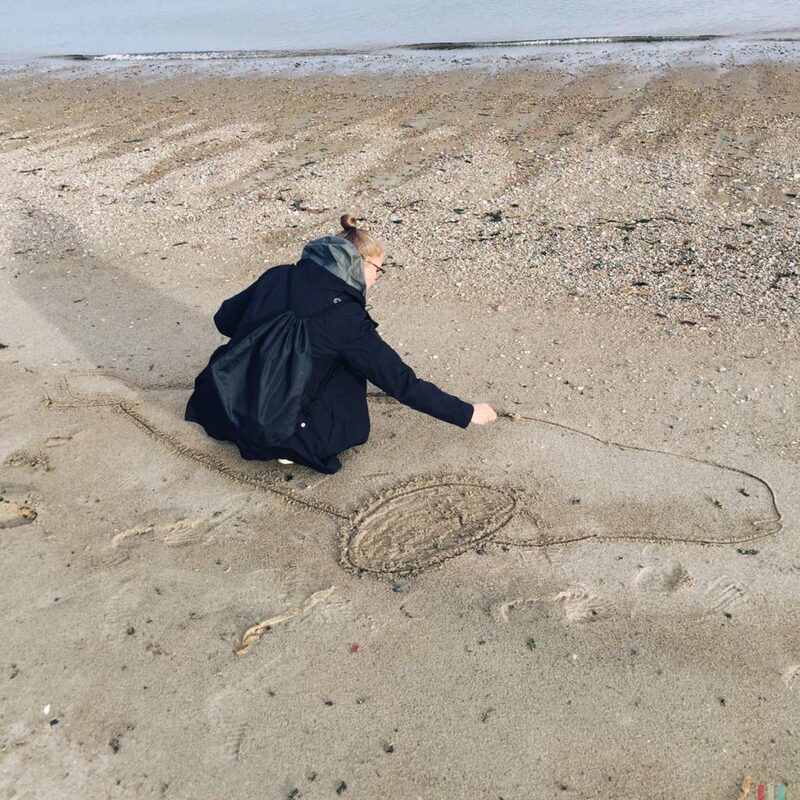 Whale researcher at the beach. At Cap de Bon Desir we spent a good five, six hours. First in the dense fog. A couple of times we could hear a whale blow. With us on the rocks about twenty people, many children, all quiet and tense. As the fog had dissipated, there came the rain, a sudden and violent cloudburst. So everyone hurried back to the whale centre to read information boards and listen to the guides. Then the sun came up and everybody went out again, waiting and watching and hoping. Such a wonderful relaxed day-on-the-beach-feeling, always mixed with anticipation and excitement, whether the fog whale would stop by again. 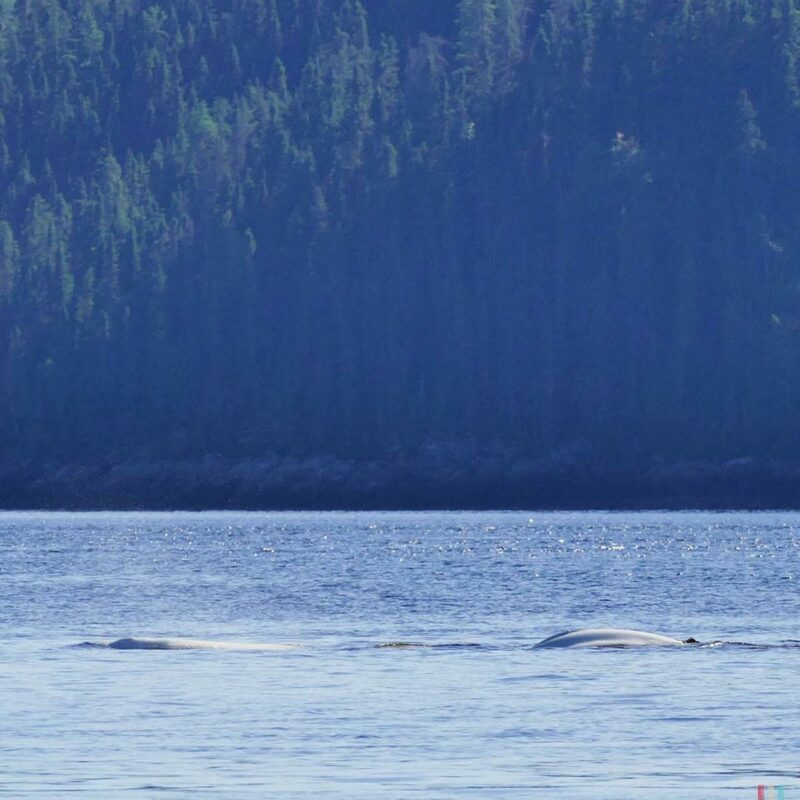 At Cap de Bon Desir you can often see minke whales swimming very close to the shore. And you even have the chance to see blue whales here. Blue whales! From the shore! There aren’t too many places like this. Children, parents and guides were silently sitting on the rocks and watching. Hardly anyone took a picture. The guides took plenty of time, especially for the children. 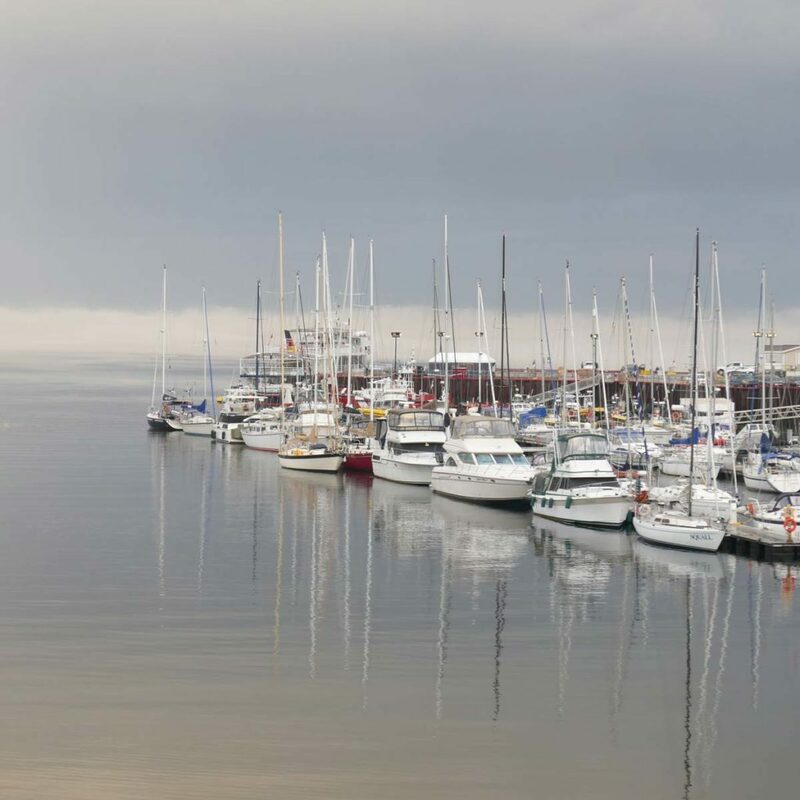 They patiently explained all the great things to discover here on the rocks – and of course on what to pay attention to on the water. Big eyes. 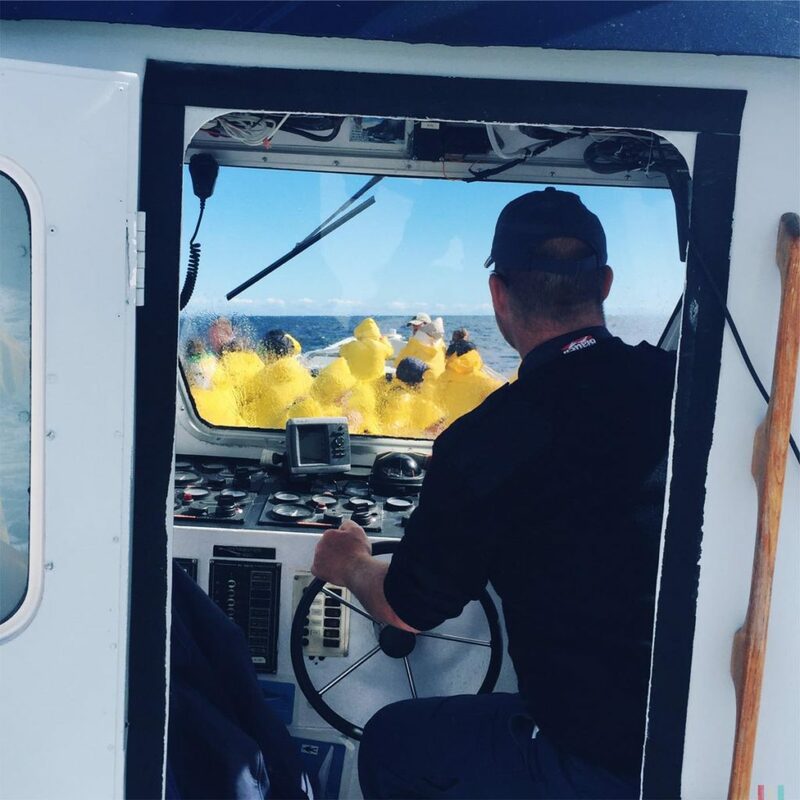 Our three boat trips were more like a visit to a zoo: ‘Dear passengers, now, we’re about to enter the minke whale sanctuary.’ But this here on the rocks was real. And in those eyes of the children you could see what’s more exciting. 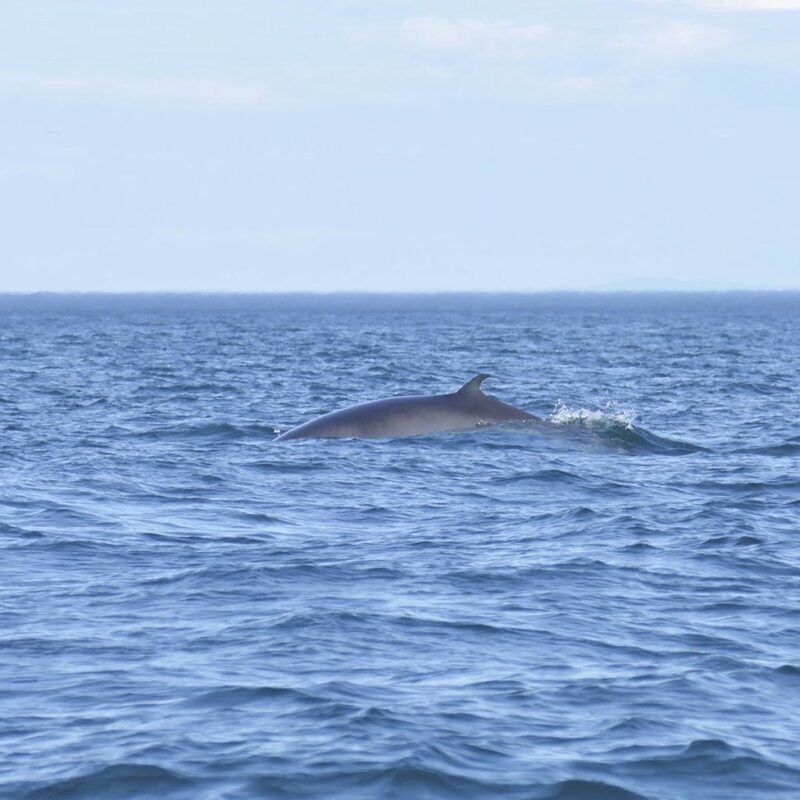 The minke whale came back for a few times. Pretty close to the shore, blowing as before in the dense fog. But this time with the perfect sight. Children, parents and guides were silently sitting on the rocks and watching. Hardly anyone took a picture. 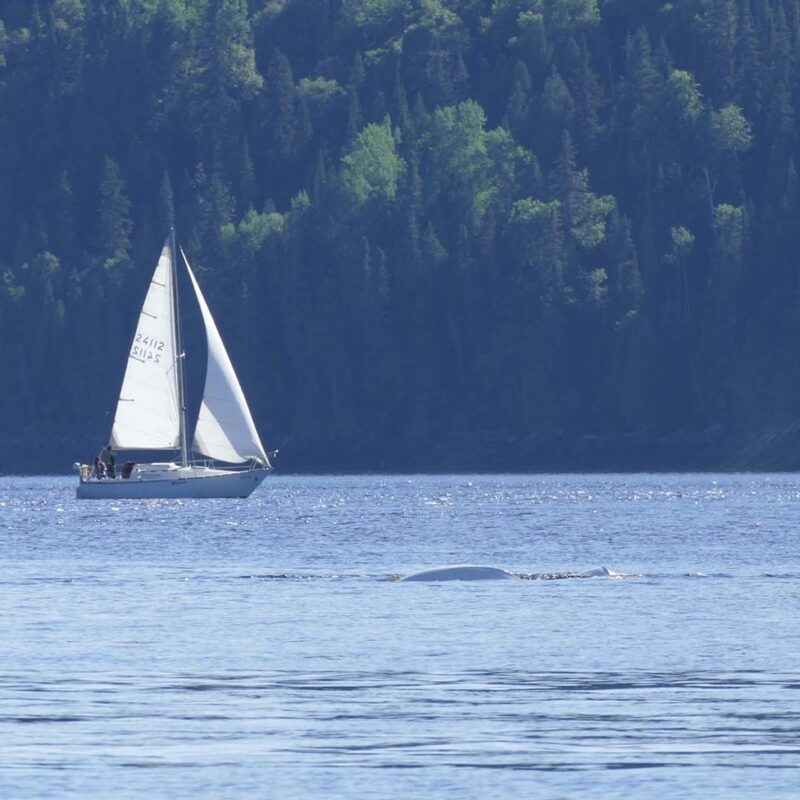 A beluga in the Saguenay fjord. We saw more than fifty of them. They were playing in the bay for hours. The belugas of Quebec are the southernmost in the world. 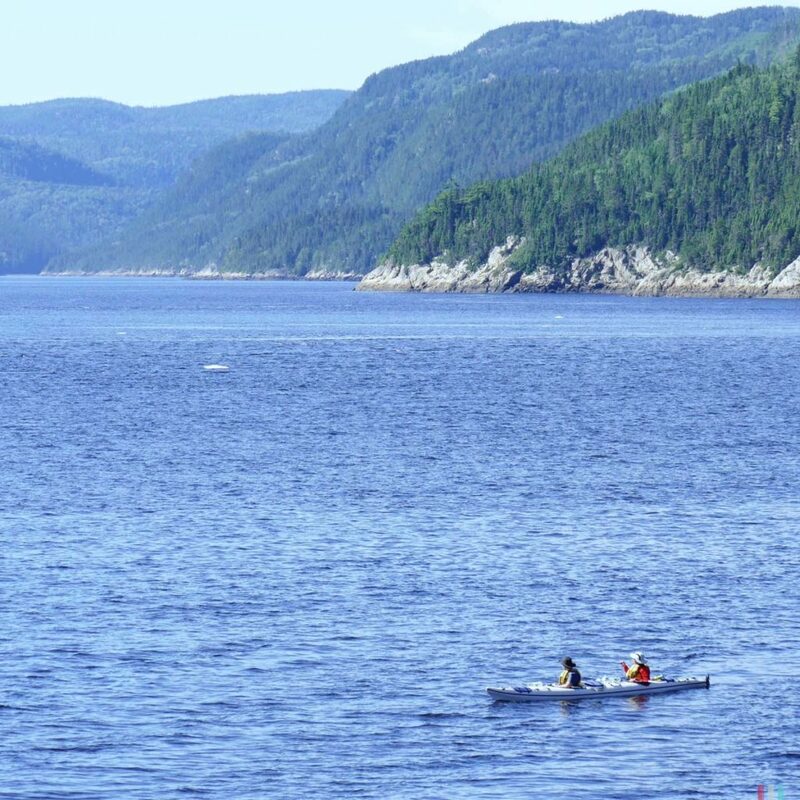 Along the Saguenay fjord you have great chances to see them from land. Belugas are arctic whales living close to the ice edge. You can see them in the arctic regions of Canada, Greenland, Svalbard and Russia. 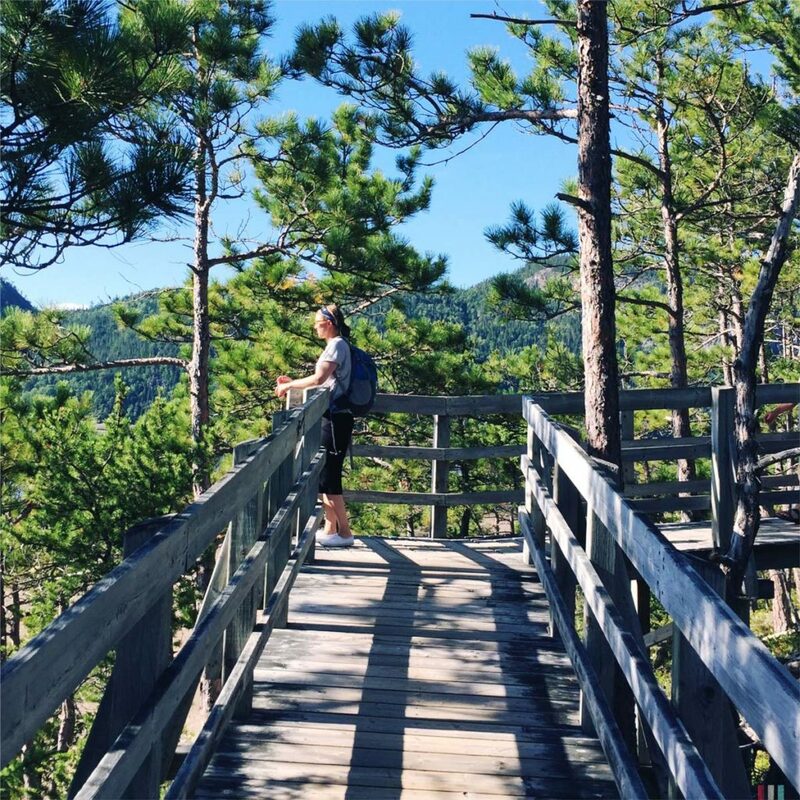 In Quebec, however, there is a population of 700 to 900 of them – nowhere else in the world will you find them so far south. 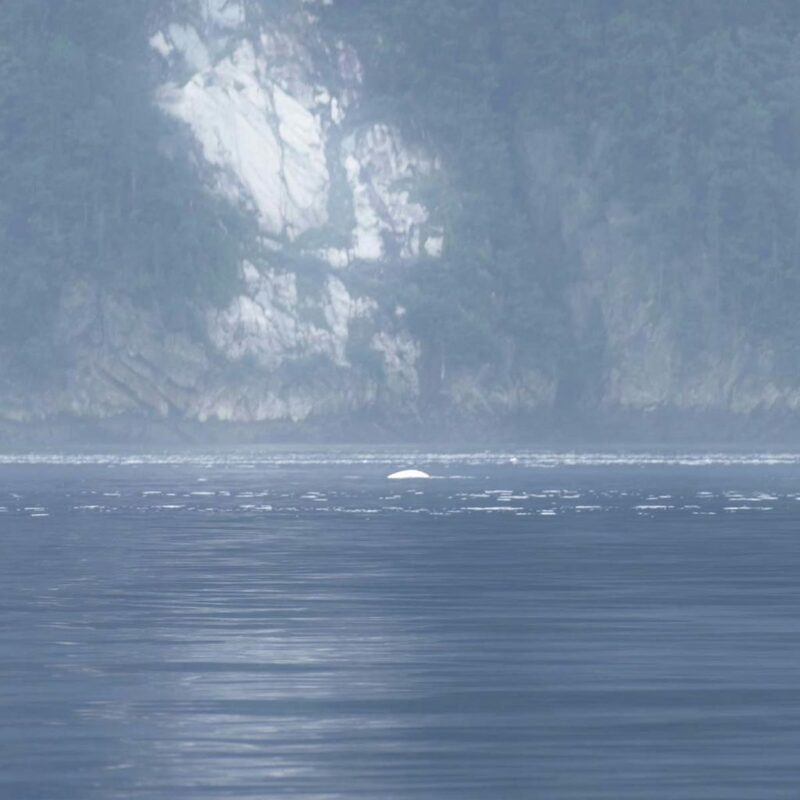 They probably got lost after the last ice age, now they live completely isolated from their arctic relatives in the Saguenay fjord of the Saint Lawrence. 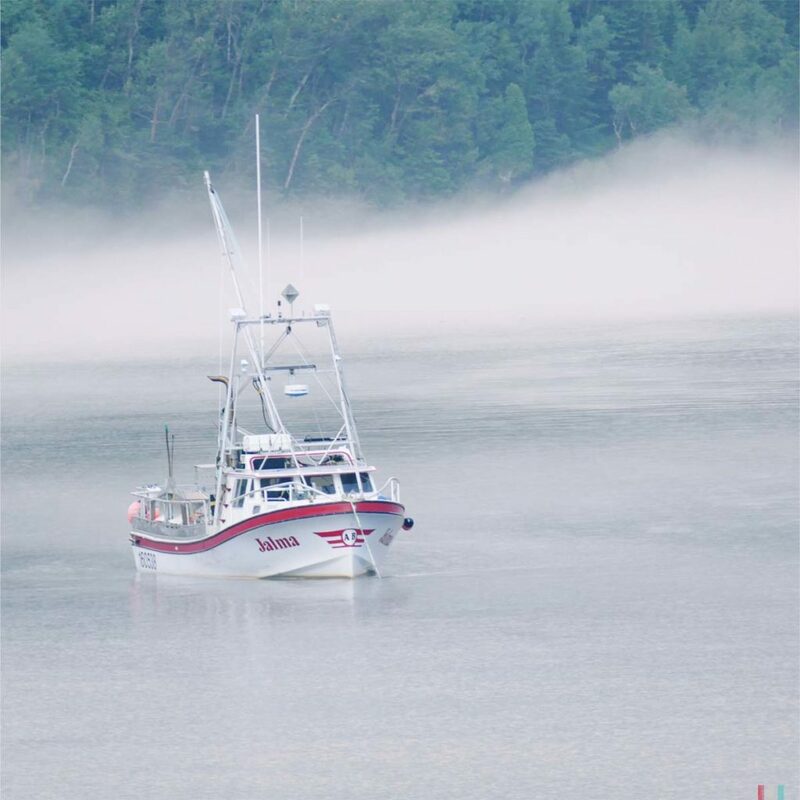 The conditions in the Saguenay are actually not unlike the Arctic, at least regarding the fauna and flora, it’s only much further south and noticeably warmer during summer. 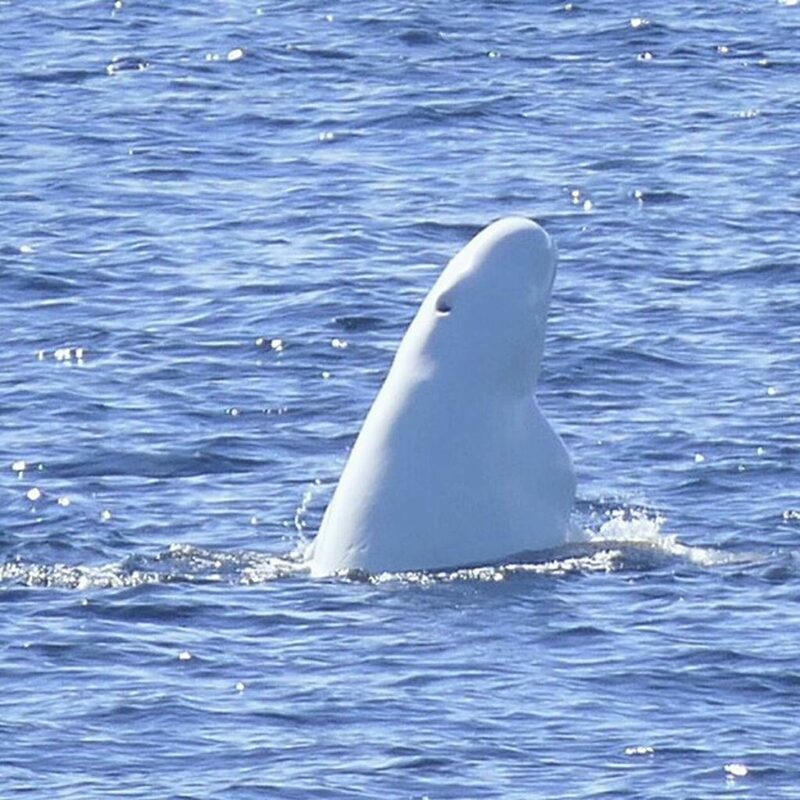 Nevertheless, the belugas seem to cope with this situation quite well – due to genetics and diseases such small, isolated groups do not have the highest chance of survival in the long term, though. The group is constantly shrinking. 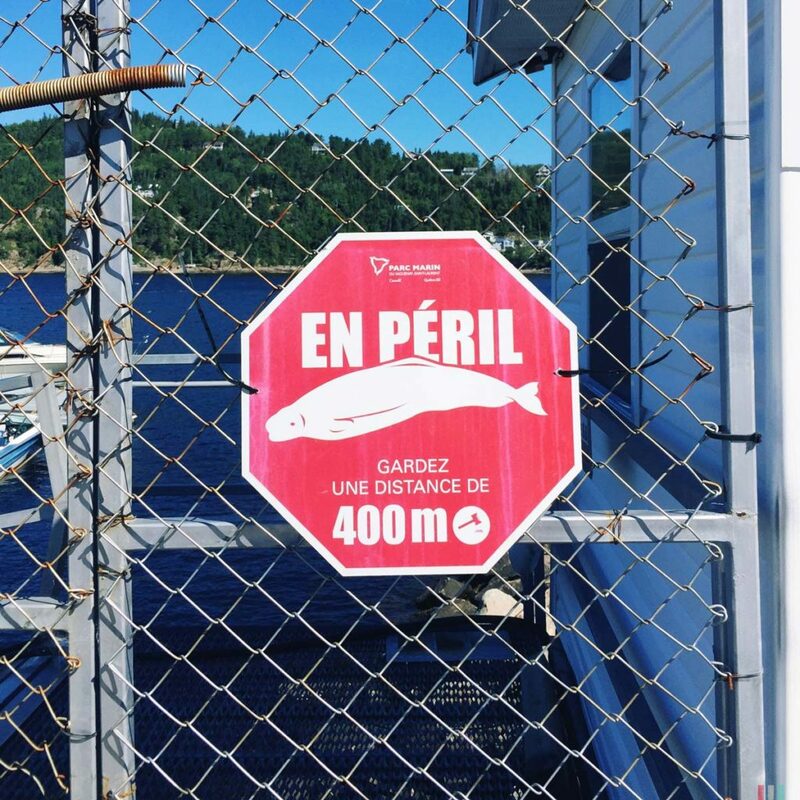 The belugas of the Saint Lawrence are therefore strictly protected, boats must not approach them, the minimum distance is 400 meters. 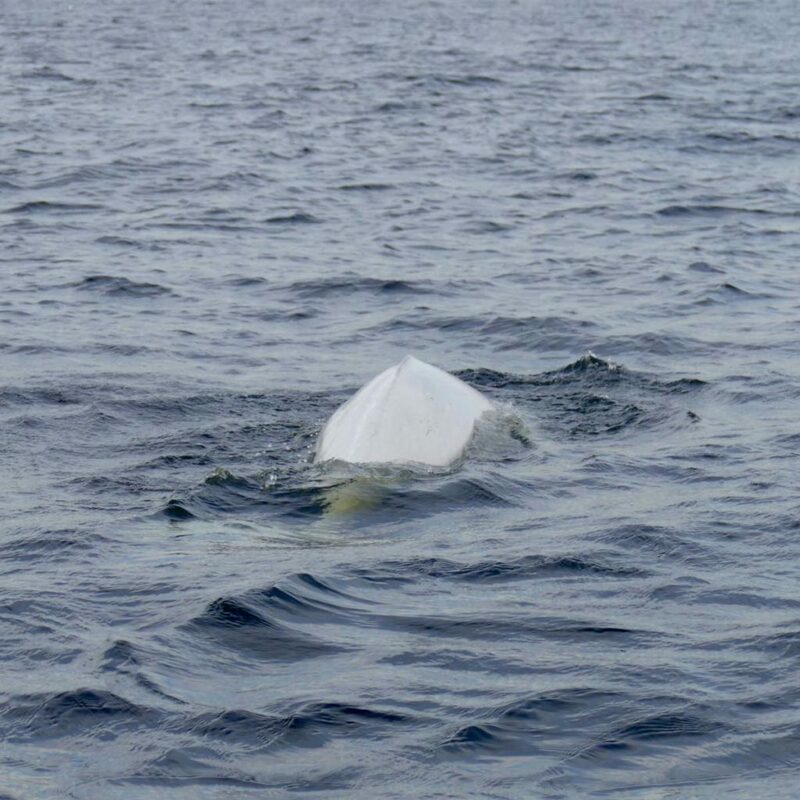 However, the belugas do not always stick to this rule, so boats approaching them have to turn as quickly and gently as possible. Hiking to the beluga bay. Relaxing at Baie de Sainte Marguerite. Arrival of the first belugas. Viewing platform at the Baie. Belugas are extremely curious and playful animals. It’s not rare that they deal so intensively with boats that they even forget to take care of their offspring. 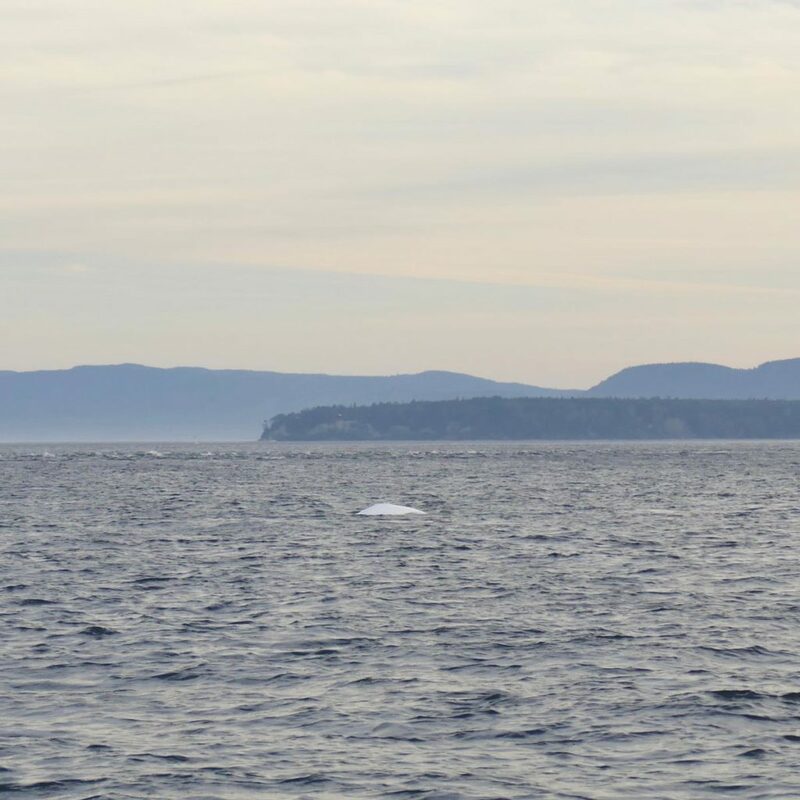 We’ve seen belugas on each of our three not so good boat tours. We always kept a good distance, and each time we moved on after two or three minutes. At least this seemed to work here. 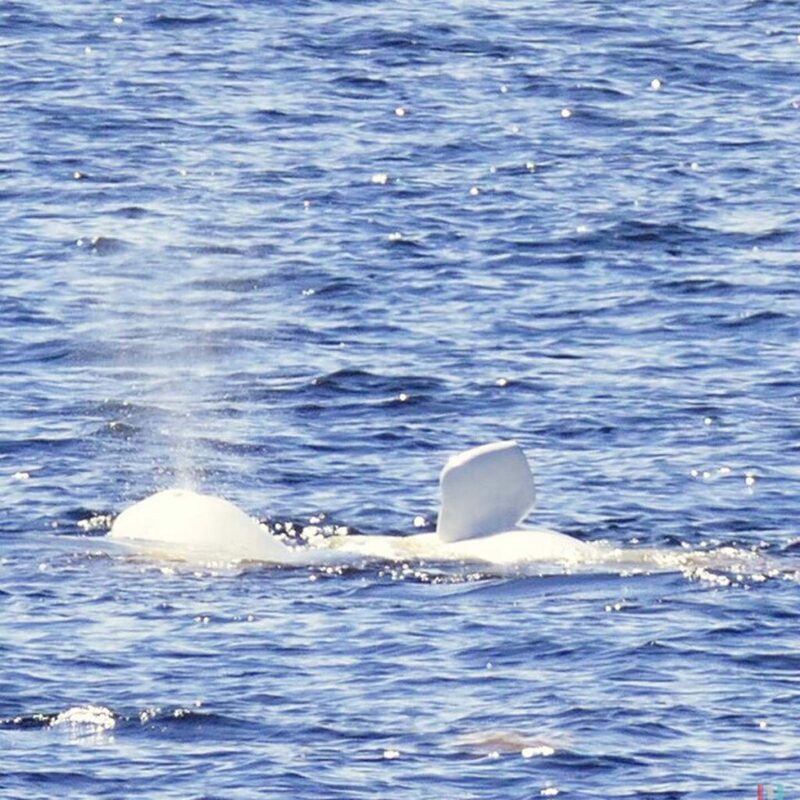 The best way to observe belugas is from land. Because of their color (and the lacking arctic ice here) they can be spotted quite easily, even from the distance. And they mostly come in large groups of fifty or more animals. If there’s belugas, there’s a lot going on in the water. 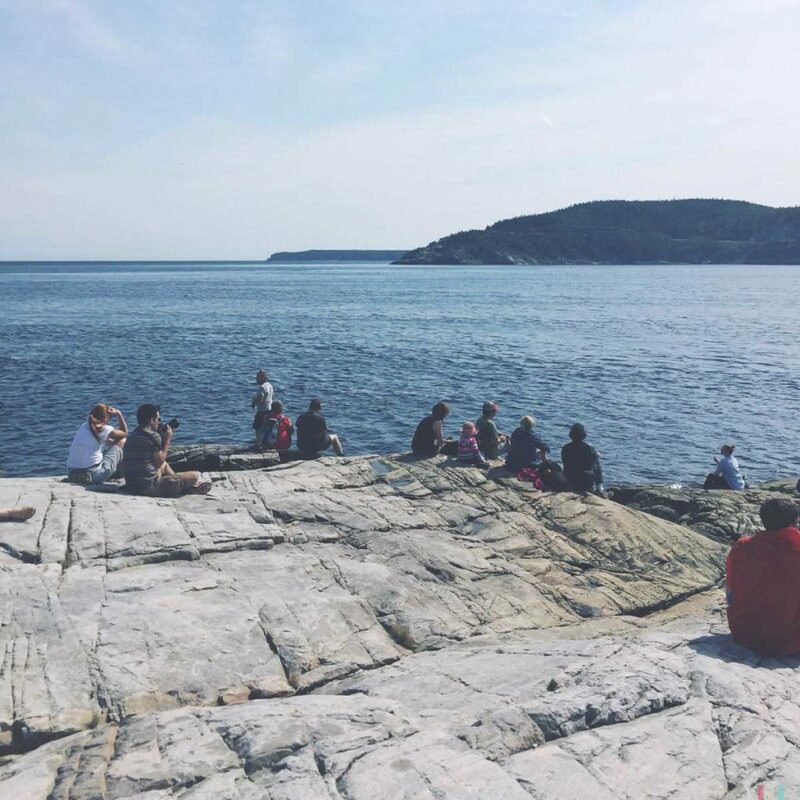 If you sit at Pointe de l’Islet in Tadoussac for a whole summer day, you’ll most likely see belugas. 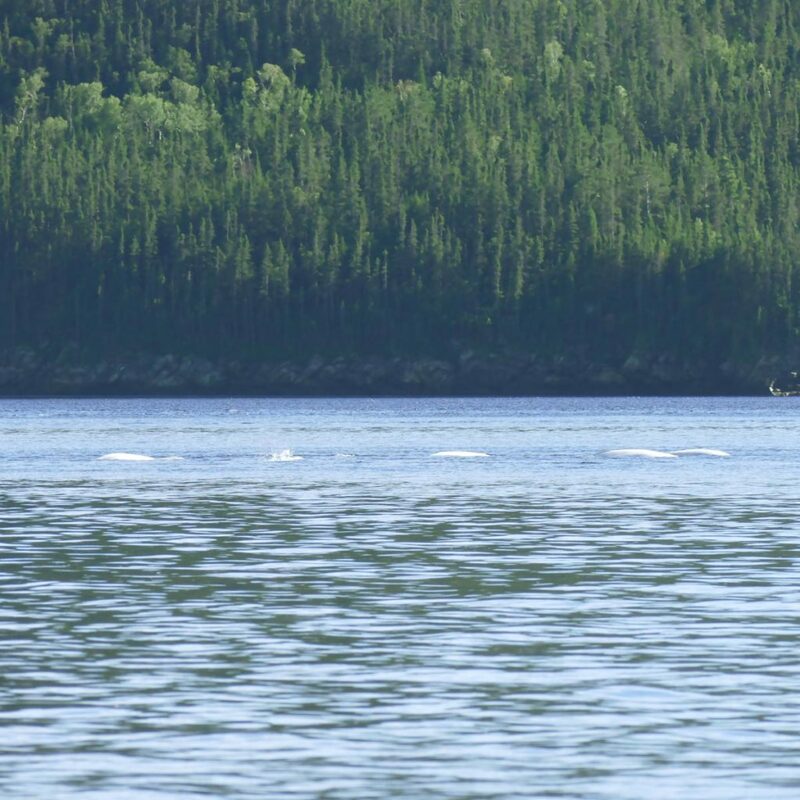 Pointe de l’Islet is located directly at the entrance between Saguenay fjord and Saint Lawrence – and the belugas tend to swim out or in at least once a day. Very good spot! An excursion to Baie de Sainte Marguerite is even better. In summer, belugas are seen here every other day. And usually they are seen for a much longer period of time, sometimes they even stay in the bay for hours. So we went on a hike to Baie de Sainte Marguerite and put ourselves on the rocks in front of the little lookout. The belugas stayed in the bay for several hours. They sing, squeak and whistle and sound like R2D2 from Star Wars. After three to four hours we had slowly become friends with the thought of being unlucky today. But then they did come! First one white back, then a second, a third, then many, many more. Only in a few minutes the whole bay was full of belugas. With the same beautiful atmosphere on these rocks as at Cap de Bon Desir a week ago: peaceful silence. Belugas are also called ‘canaries of the sea’. They can sing, squeak and whistle non-stop for hours, in virtually every conceivable variation. You can even hear it from the distance and very well above the water. Mostly they sound like R2D2 from Star Wars, sometimes also like Chewbacca. Fascinating animals, surreal day. The belugas stayed in the bay for several hours. Most whale watchers went home in the evening. So did we. The belugas just kept playing. 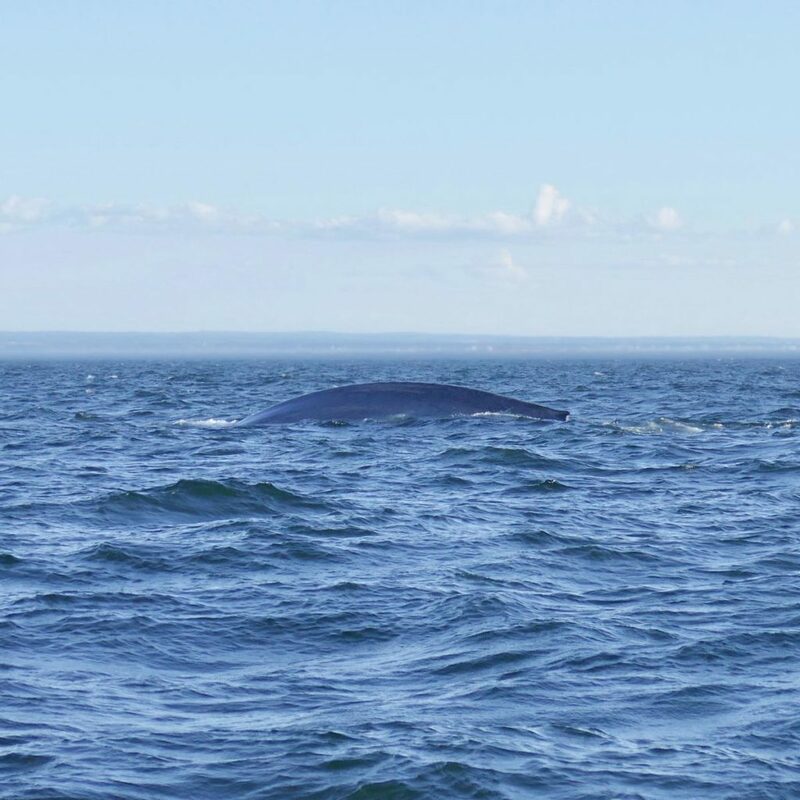 A blue whale at the Saint Lawrence, surfacing not more than 20 meters next to our boat. Incredibly impressive! The blue whale is the biggest animal ever. You've checked your facts and think you're prepared. Until this giant shows up next to your boat. 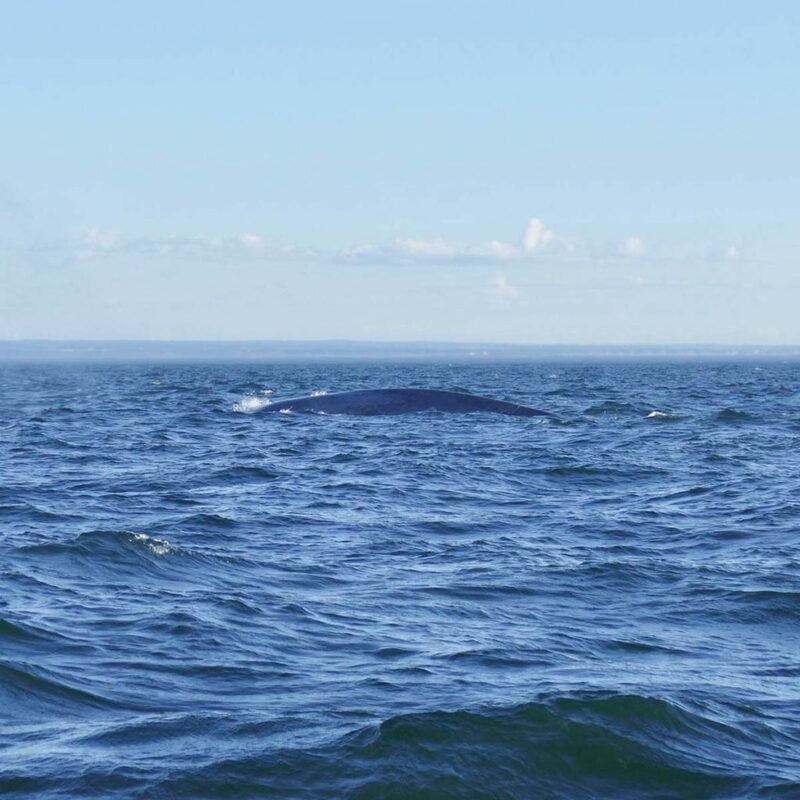 We had very much hoped to meet a blue whale in Quebec. 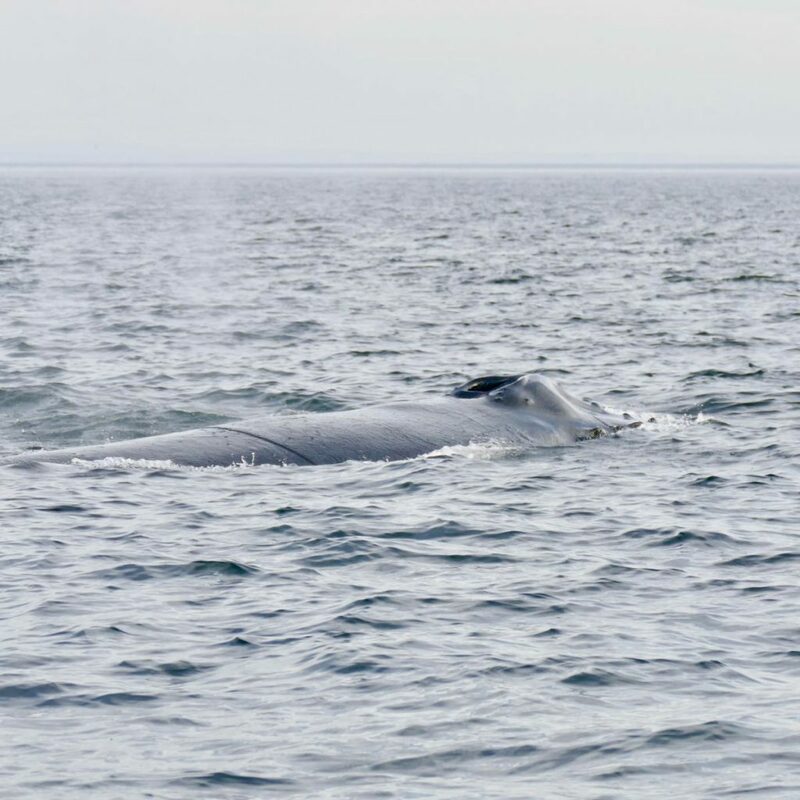 A few weeks ago in Iceland we had barely missed them: two or three days after our departure from Husavik we got the news that several blue whales had come to Skjalfandi Bay and were spotted for over a week. Iceland is the best place in Europe to meet blue whales, next to the Azores. In this regard, however, the Saint Lawrence in Quebec is even one of the best places in the world. 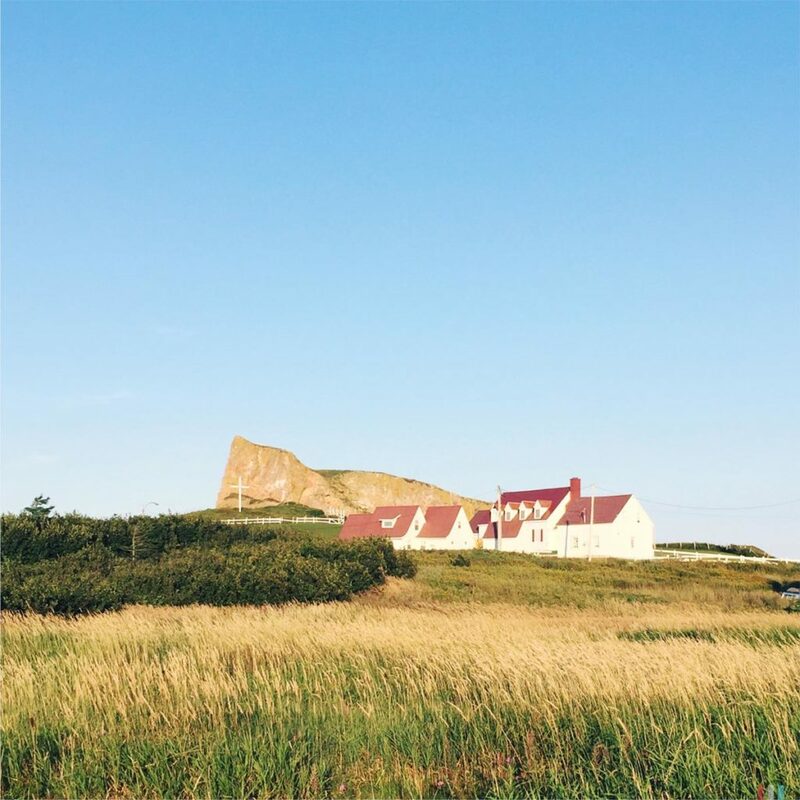 Along the whale route you can see them mainly between August and October, in the area of Cap Gaspe from May. In most summers blue whales are spotted here on a daily basis. 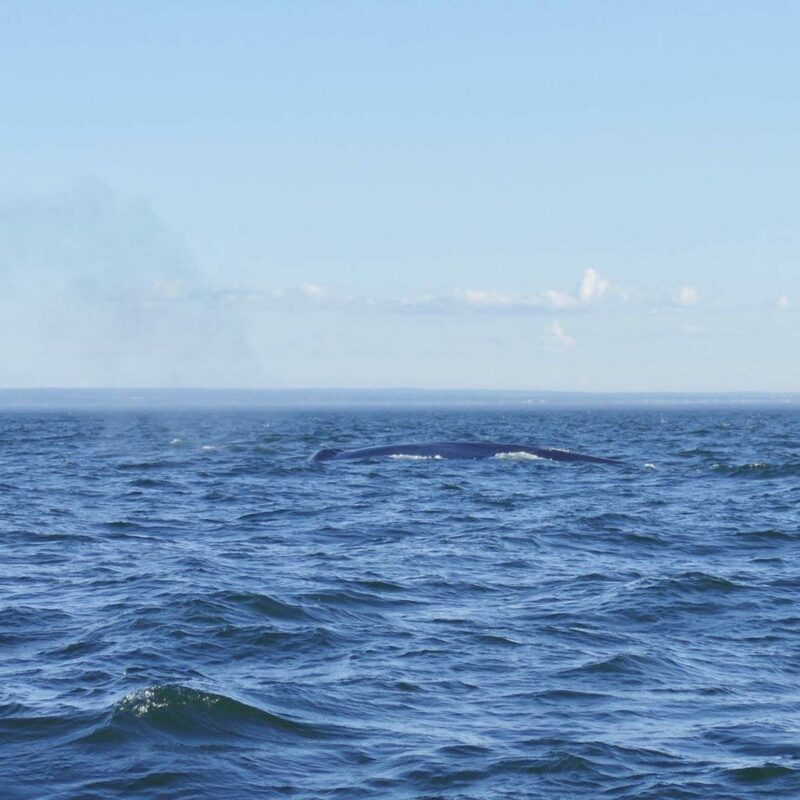 I was impressed by our first blue whale sighting for a good week. Immensely impressed. You actually know it all before: the blue whale is the biggest animal that has ever lived on this planet, bigger than all dinosaurs, thirty meters long, 190 tons in weight, etc. etc. – but you need quite good comparisons to really understand and envision this size. For example, I already have calculated on this page that a blue whale in maximum configuration is about as heavy as an empty Boeing 757, ten mid-size cars, twenty elephants and a good hundred people. Together! Elsewhere, one can read that the heart of a blue whale is as big as a small car and its tongue as heavy as an elephant. 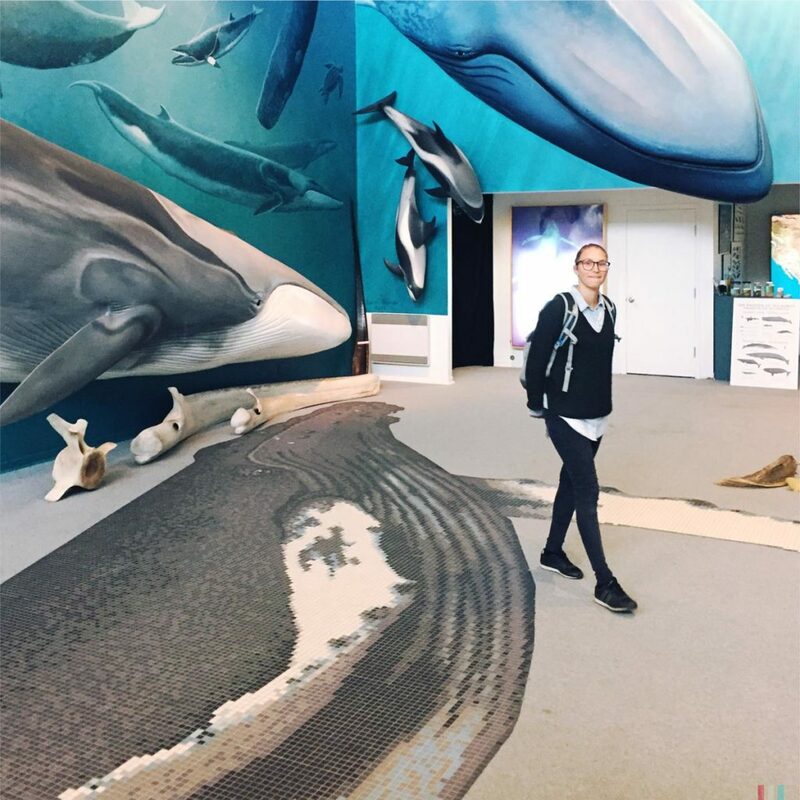 At the whale museum in Husavik we stood in front of the skeleton of a blue whale and found out that we could easily park our mini camper in his jaw. So, you’re prepared, theoretically. 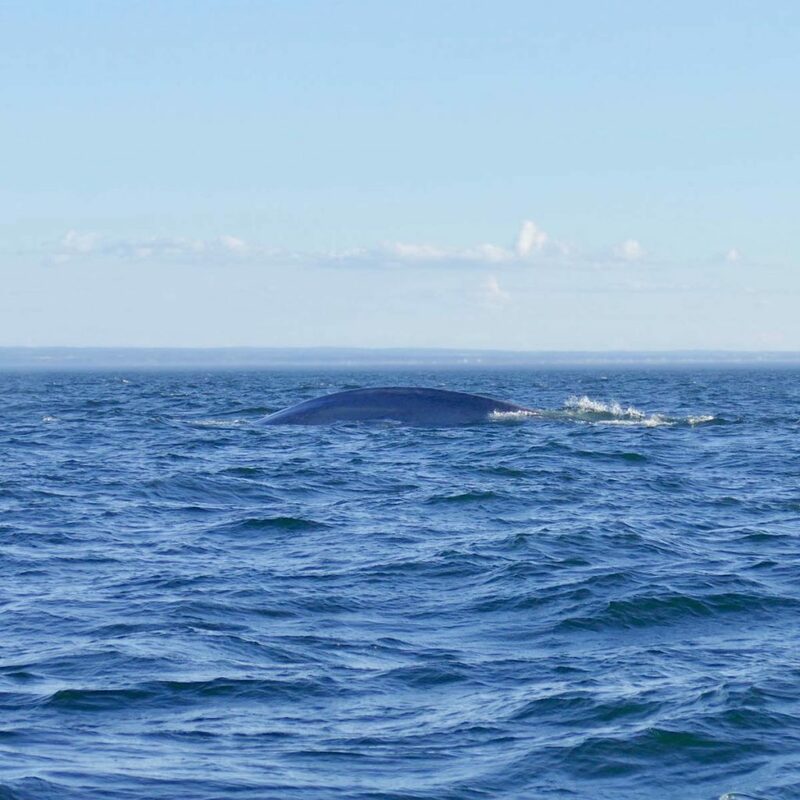 And then comes the moment when a living blue whale emerges less than 20 meters from your boat. All your preparation does not help. For the first time ever, I saw a small trace of fear in Theresas eyes during a whale watching tour. She was really scared for a second, I think. Of course she denies that and maybe I got it wrong. In any case, no one was prepared for such a giant. For other whales this is a quick thing: emerge, blow, back, fluke, gone. With a blue whale things are a bit different. First of all, that blow. You don’t look forward, you look upwards, into the sun. And then this back. That’s a really endless long back that’s rolling slowly through the water. 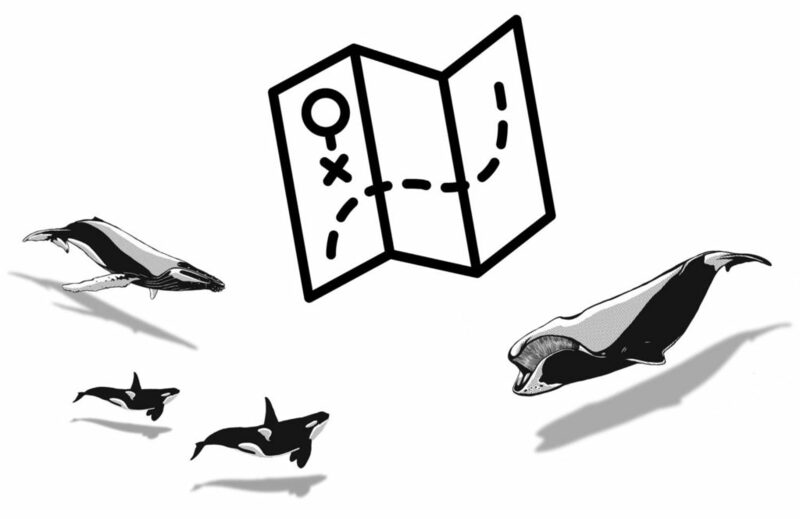 For other whales this is a quick thing: emerge, blow, back, fluke, gone. Even with fin whales. 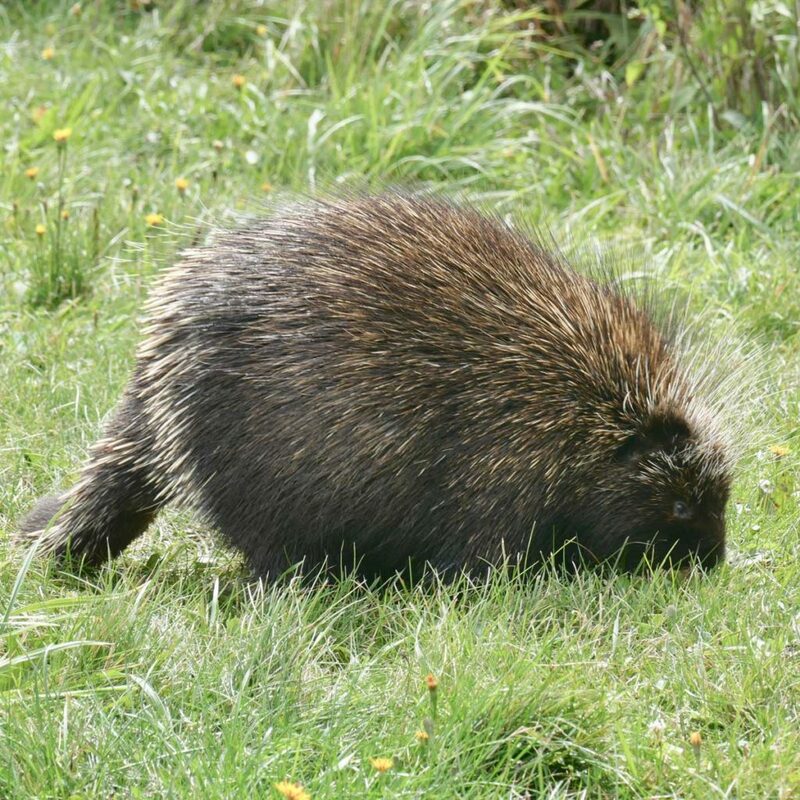 Although they are 20 to 25 meters long, they move much faster. With a blue whale this is different: emerge, high blow, back, back, back, more back, even more back, still back, no fluke, gone. We saw five blue whales that day. On one of our three really not so good tours from Tadoussac and Bergeronnes. I hope someday we’ll see blue whales on a really good tour and with really good guides. Until then, I really don’t want to miss this moment.